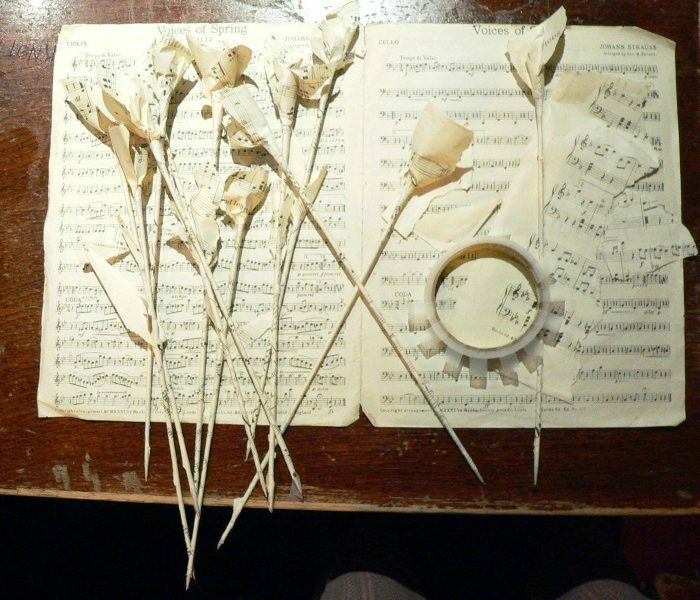 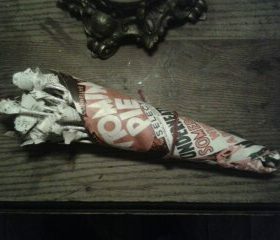 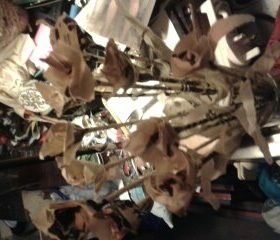 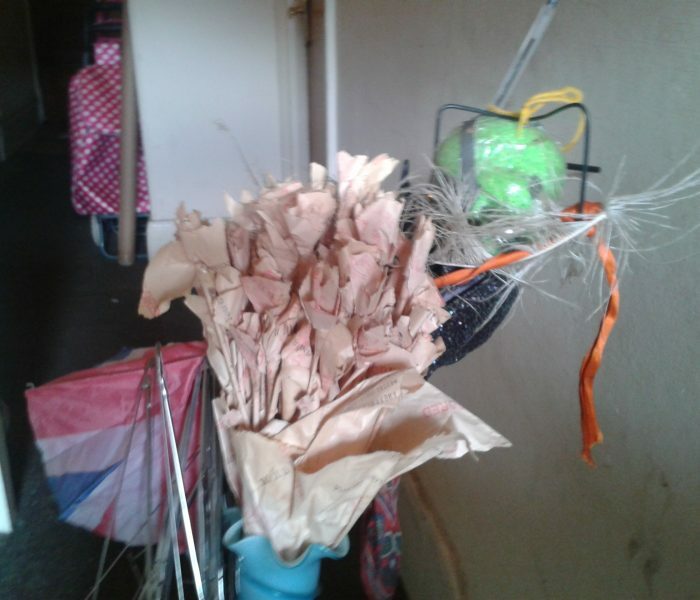 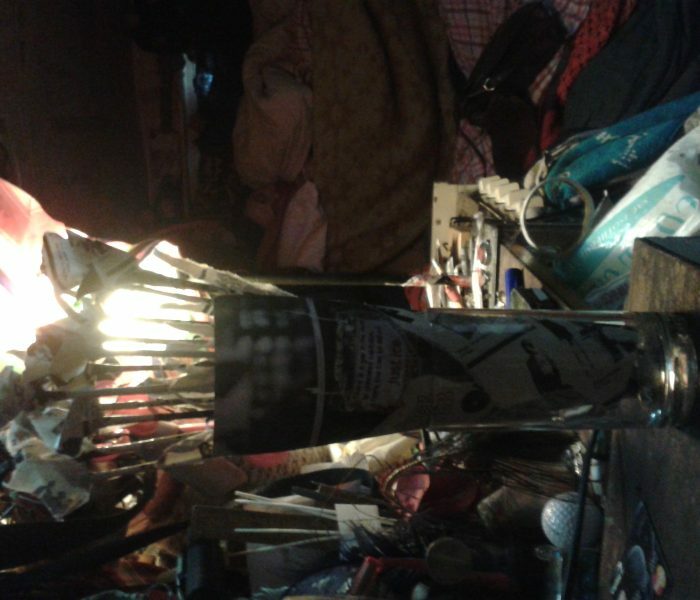 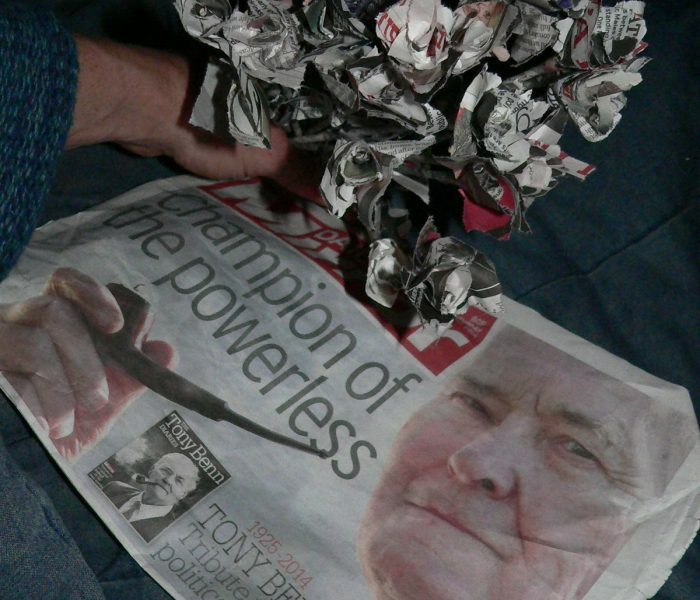 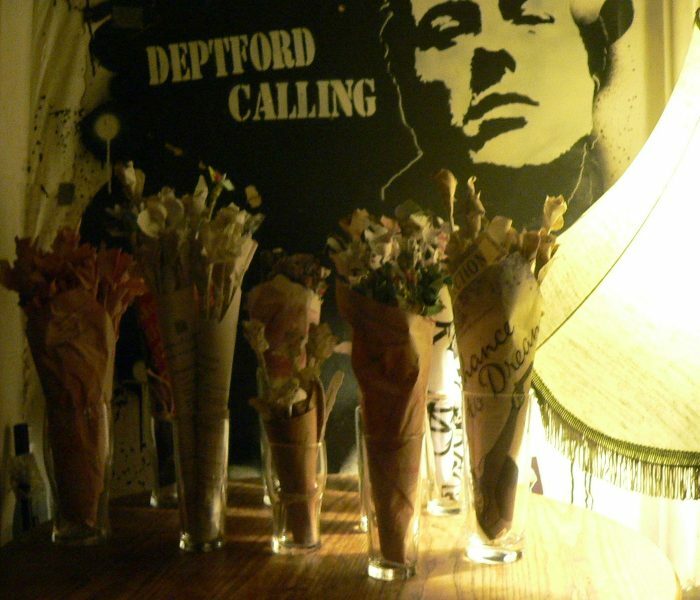 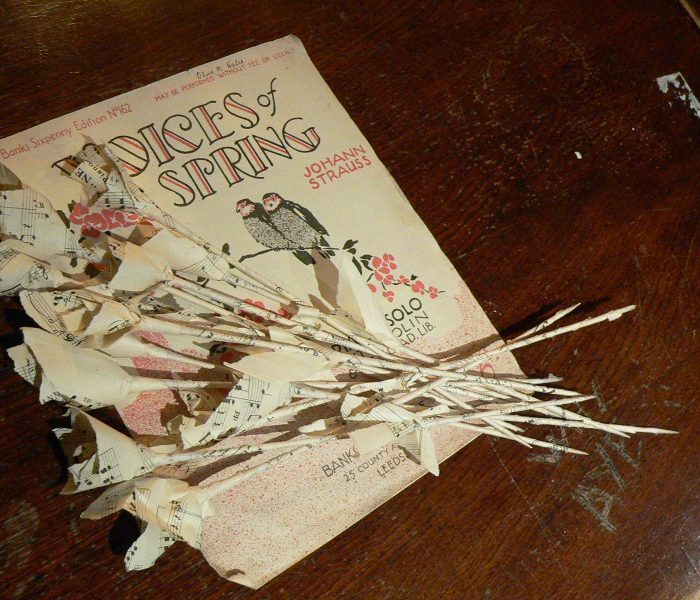 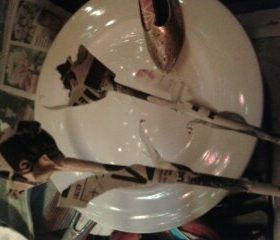 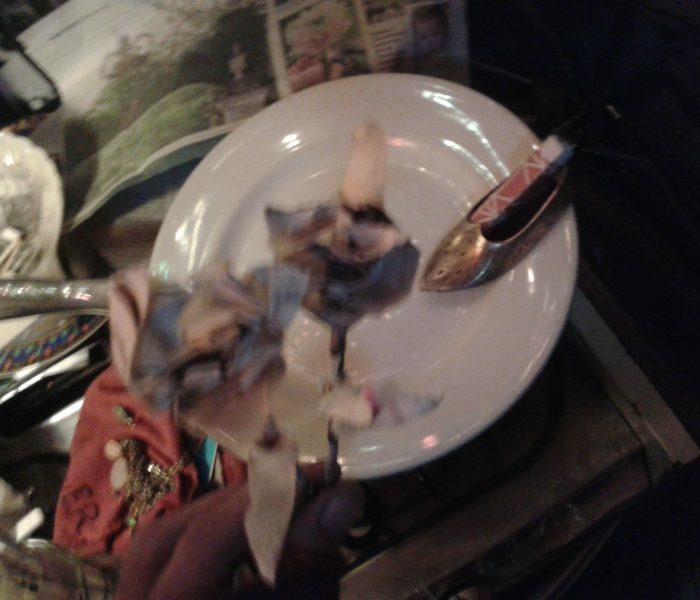 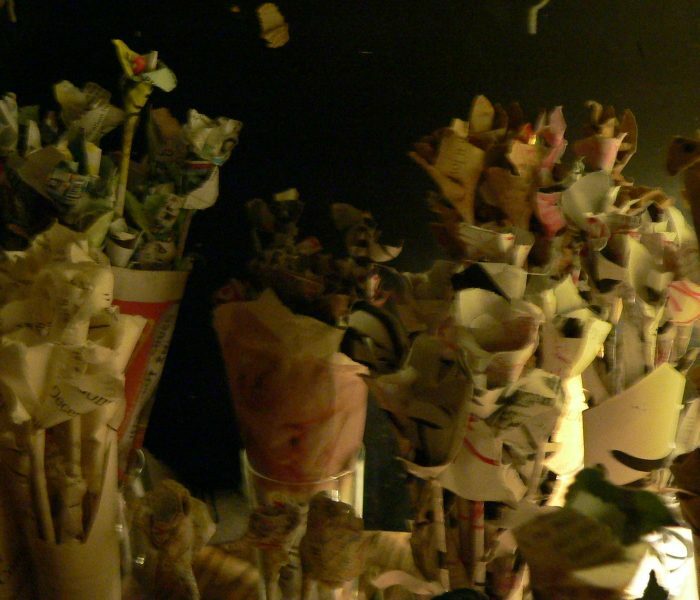 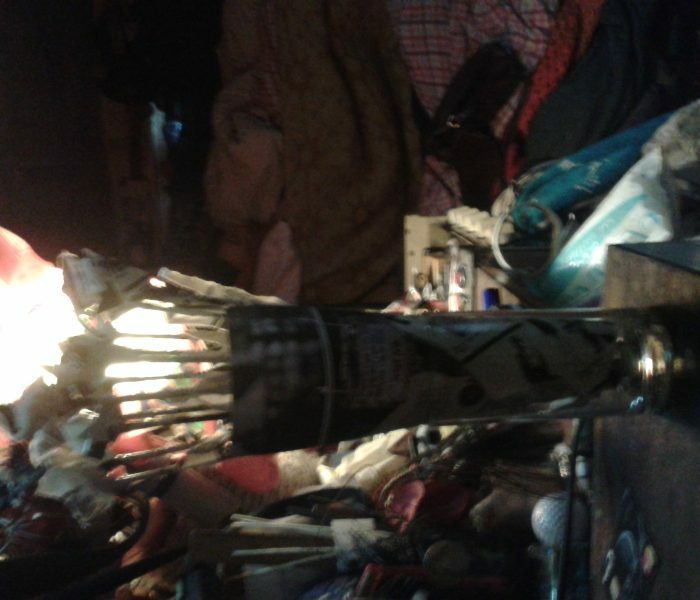 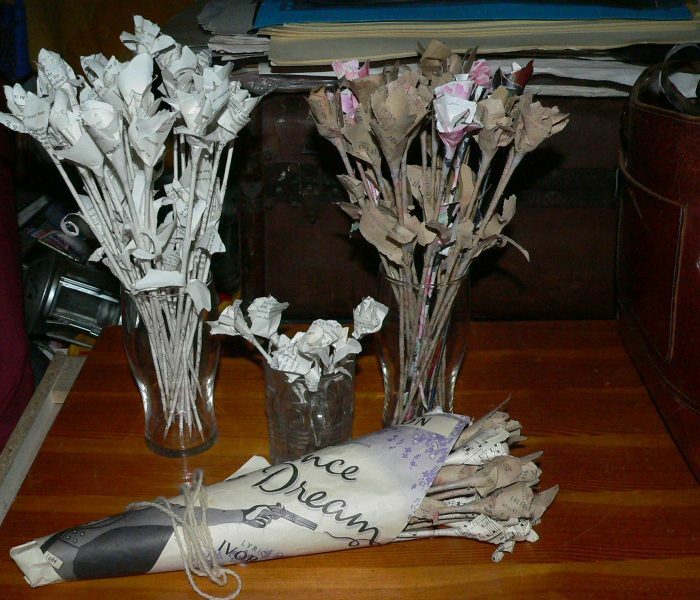 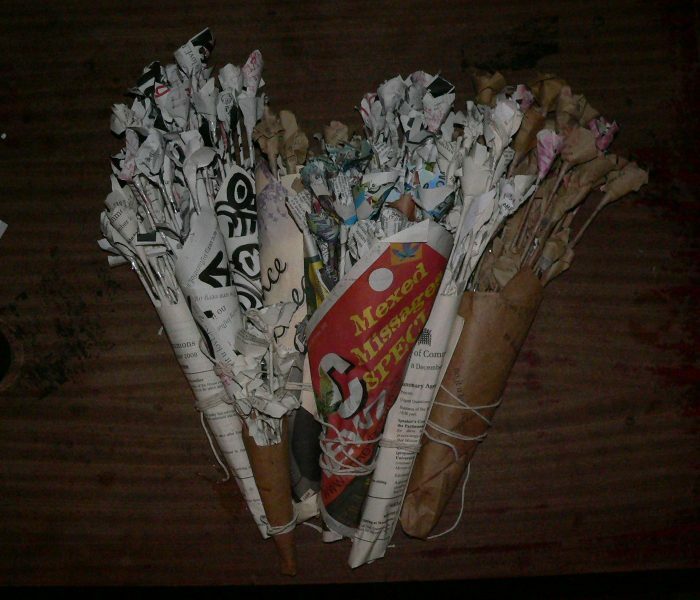 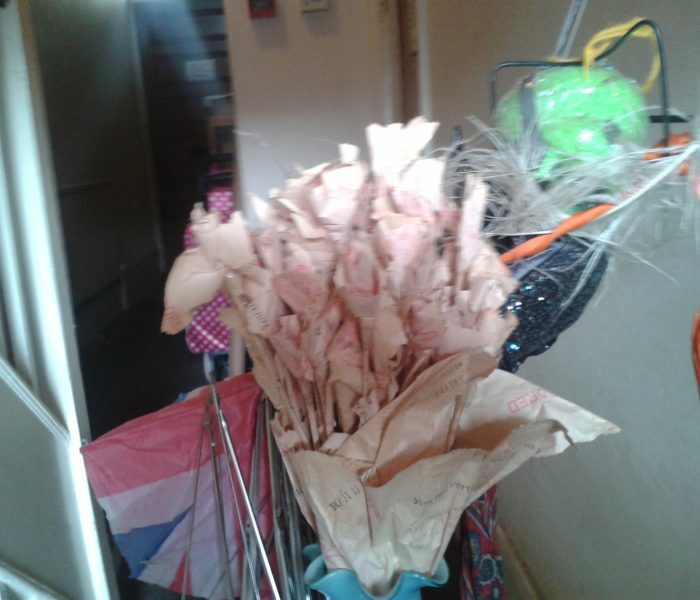 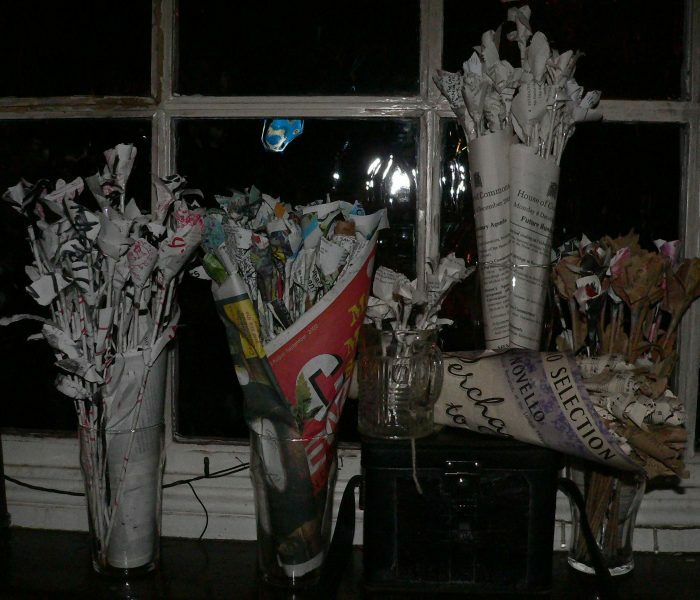 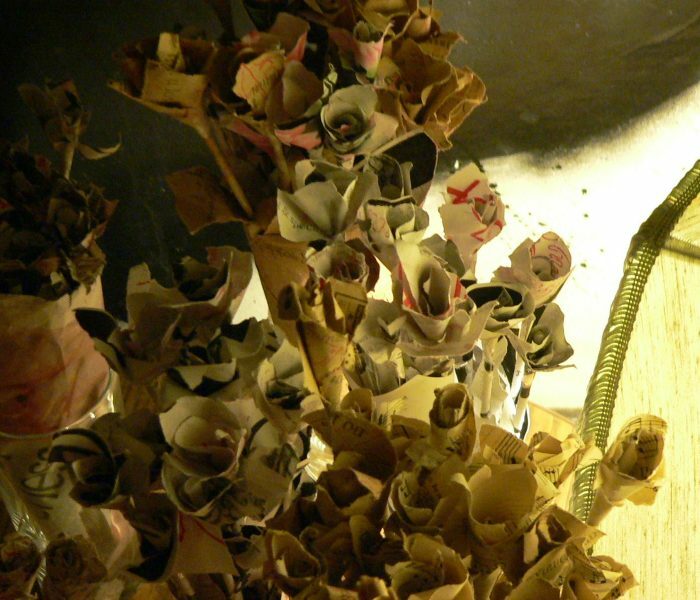 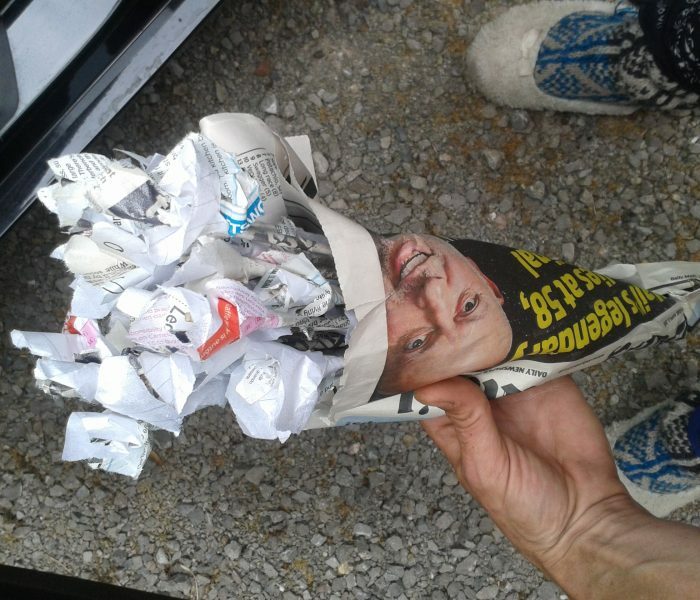 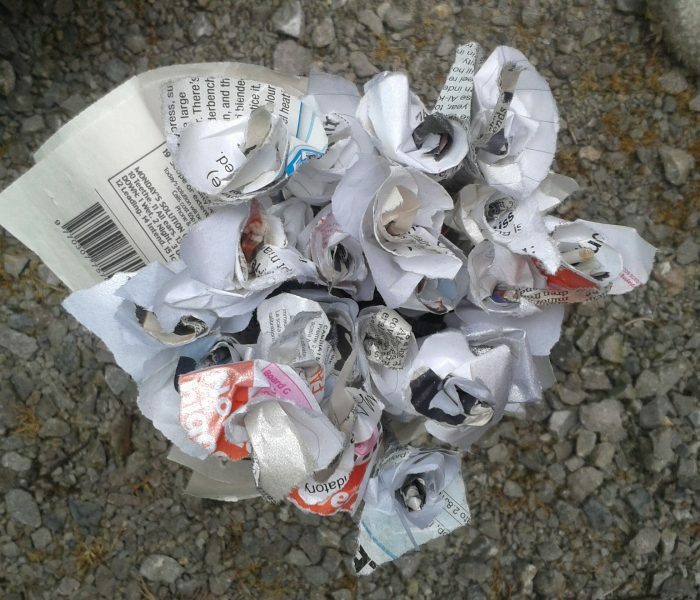 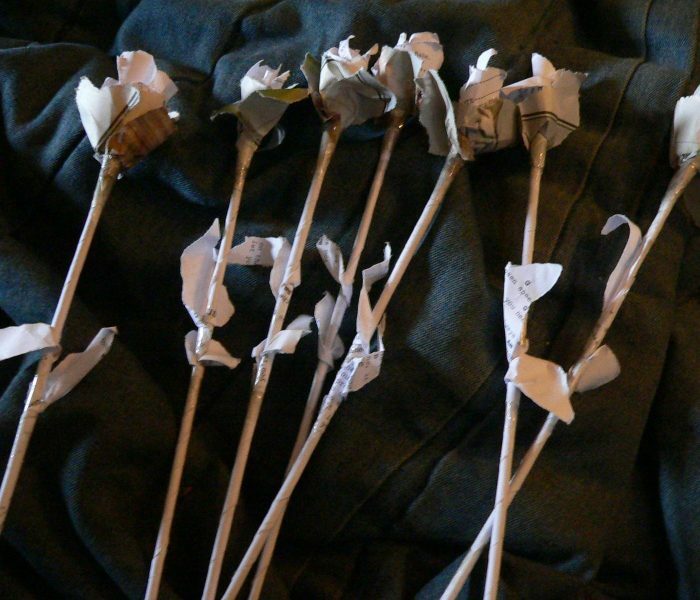 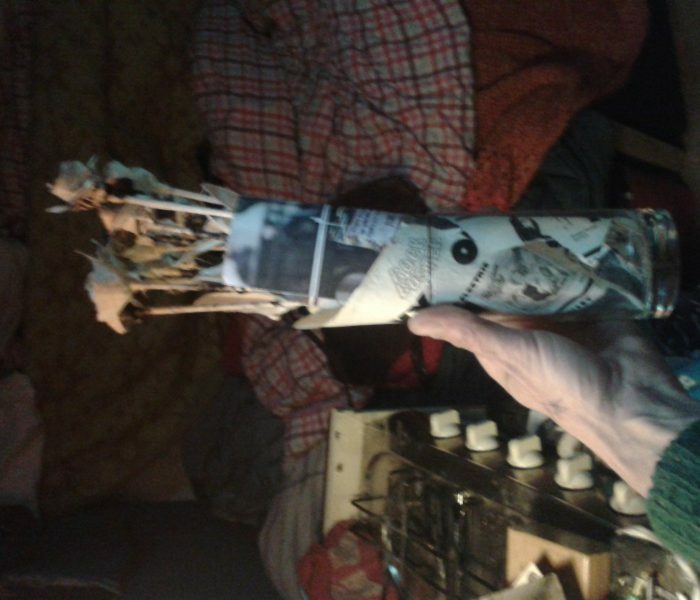 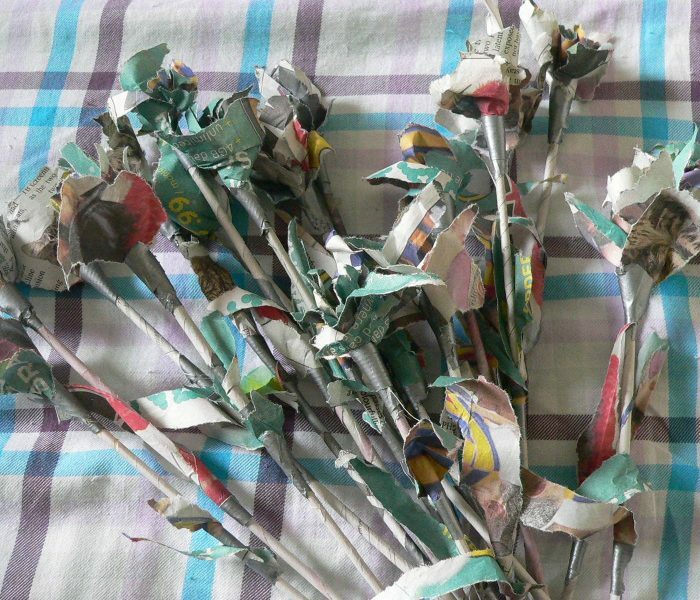 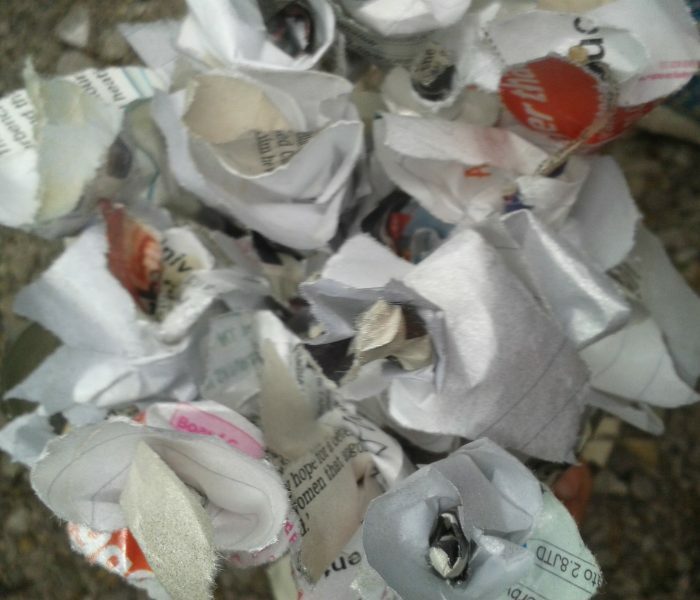 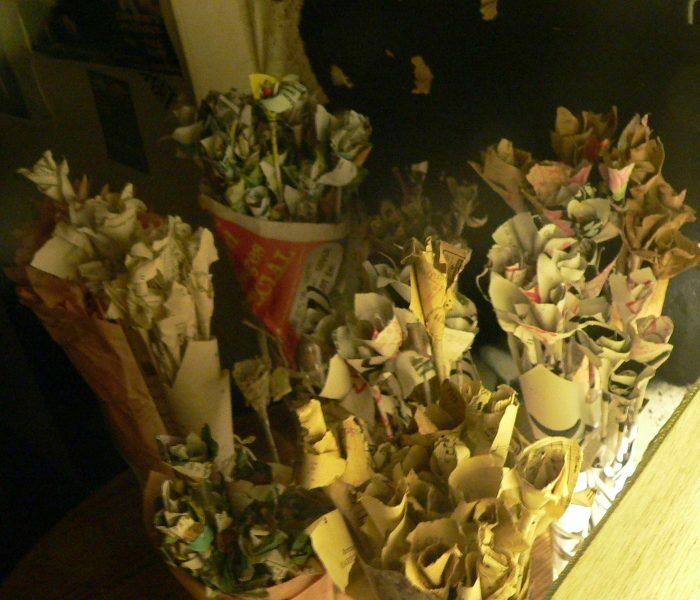 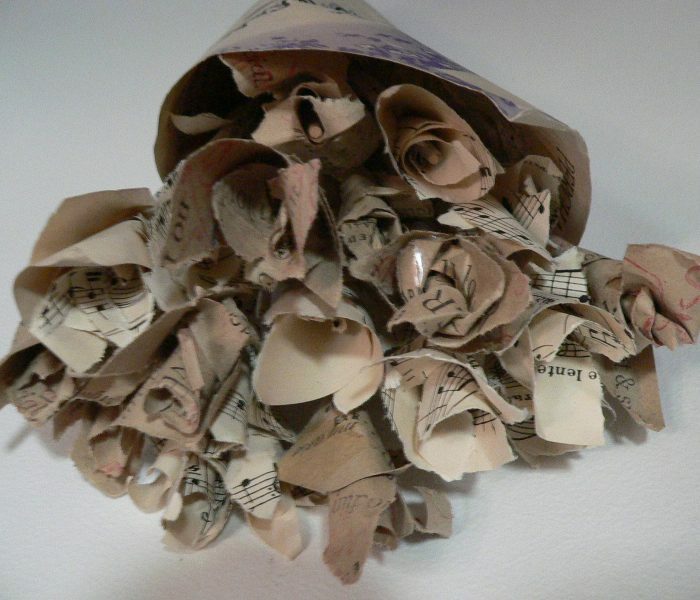 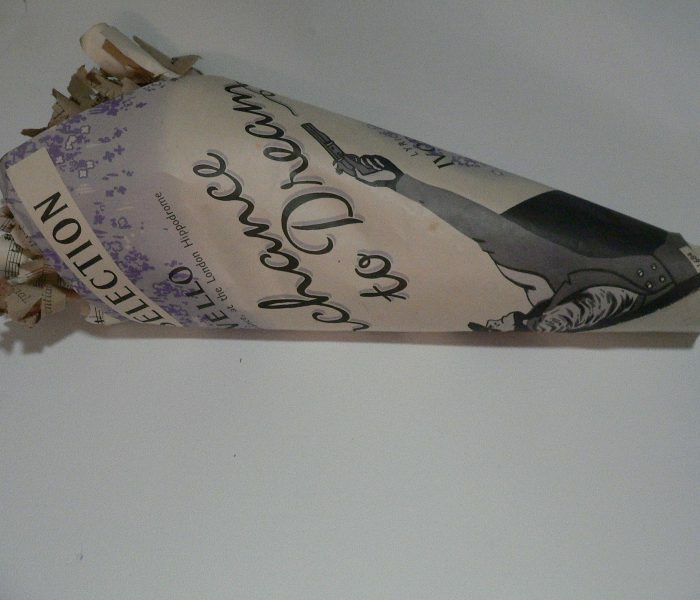 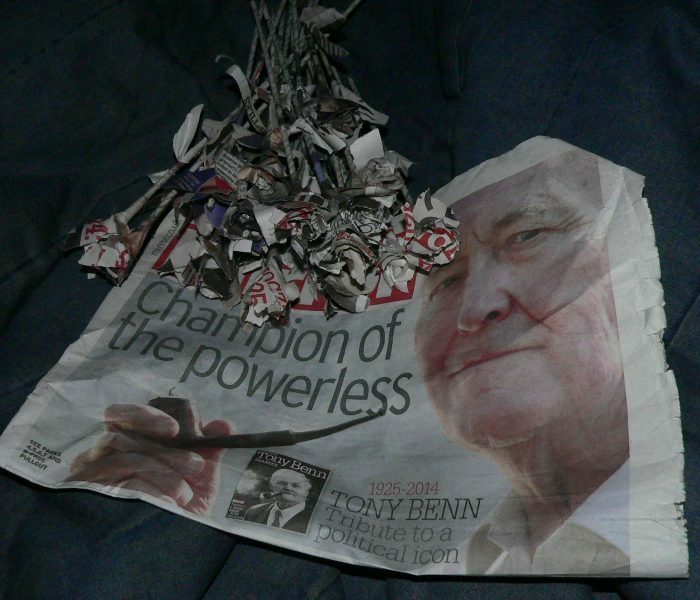 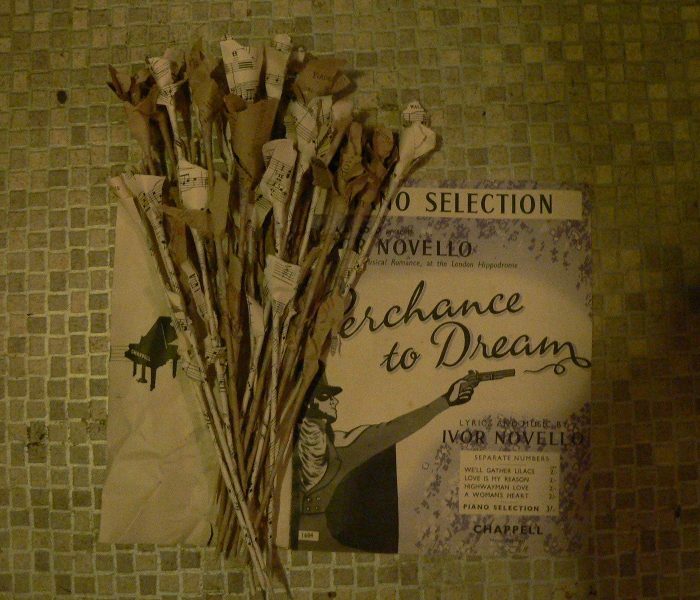 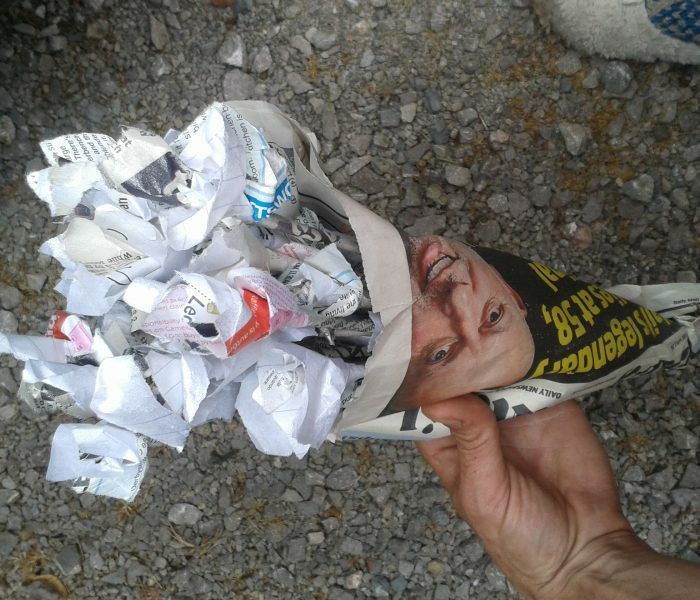 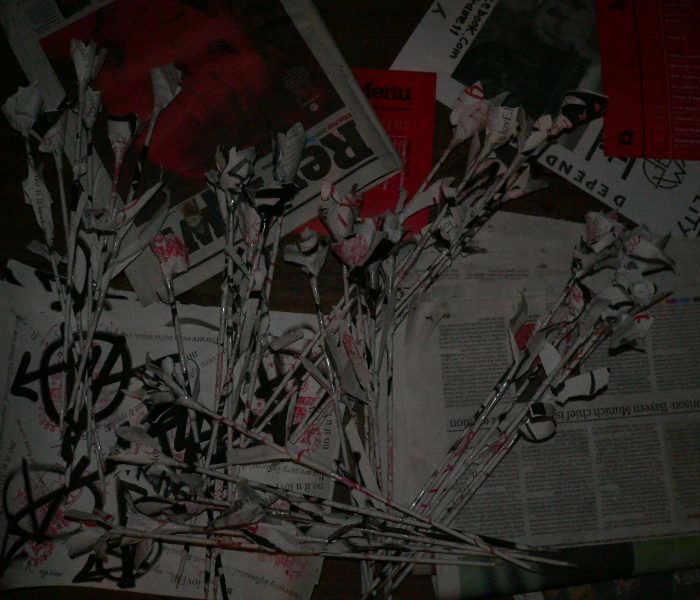 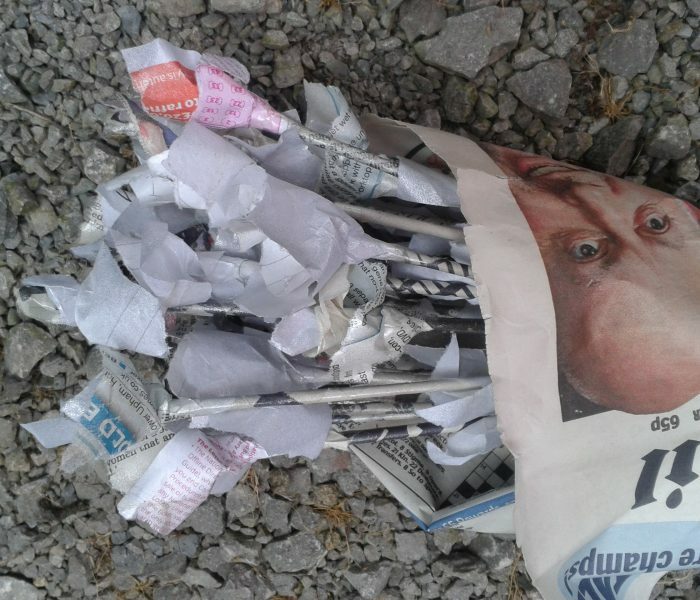 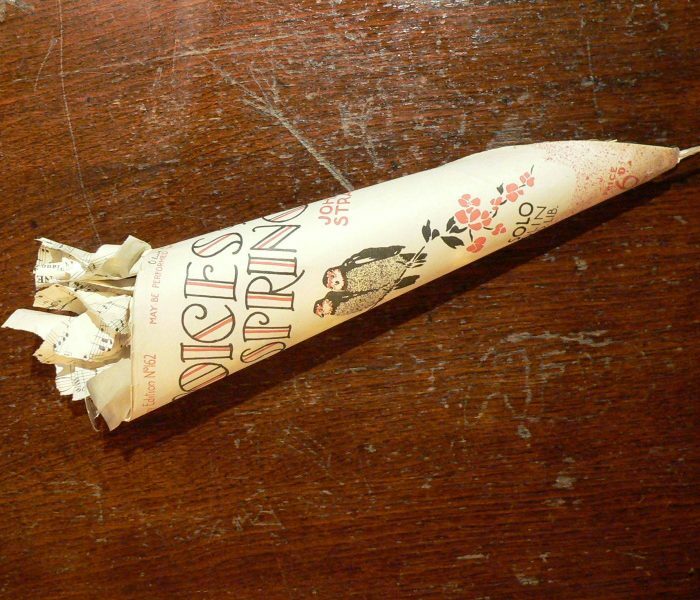 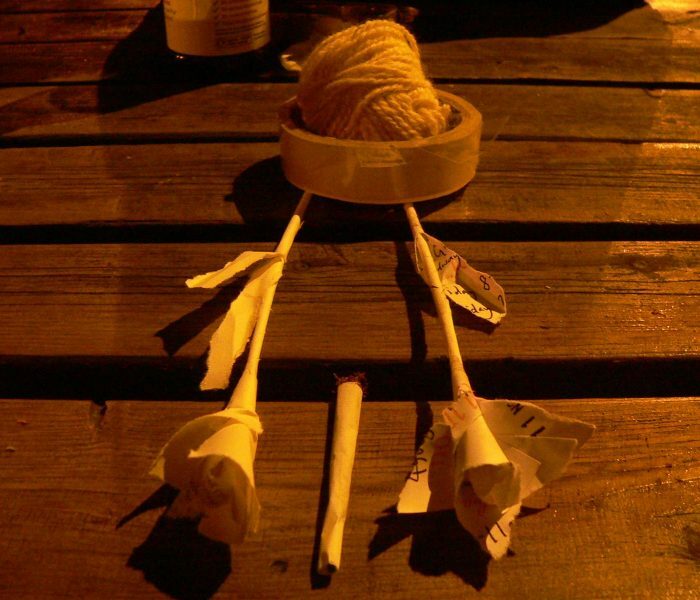 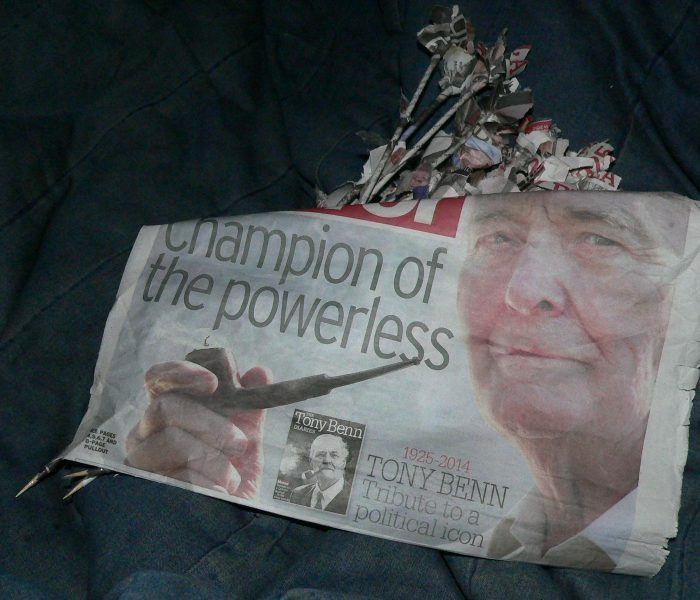 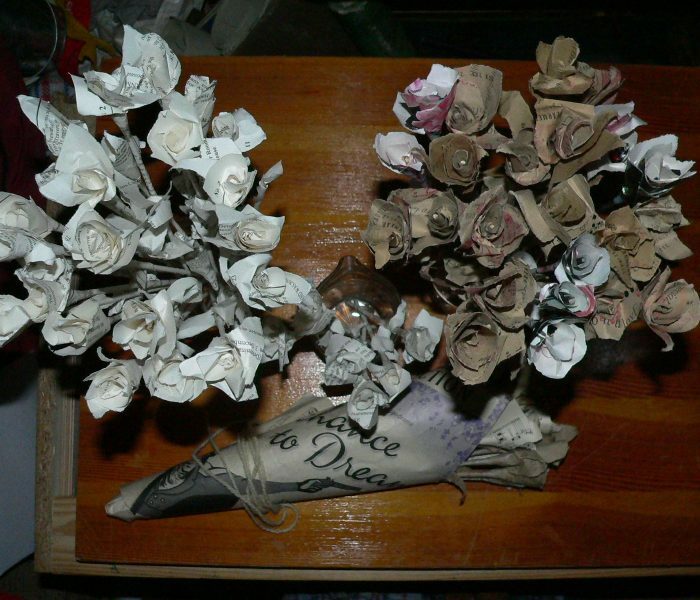 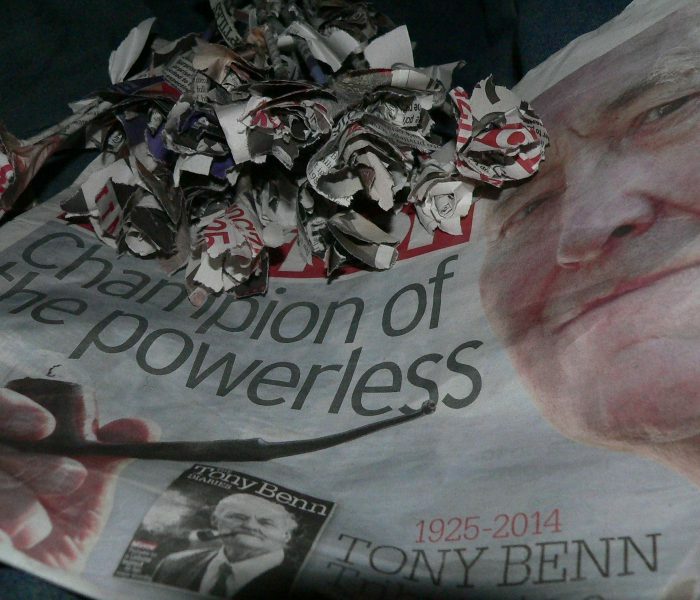 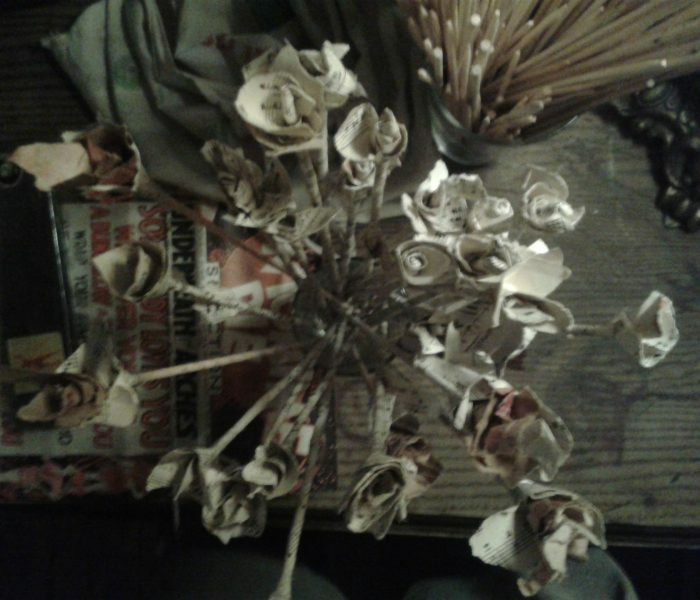 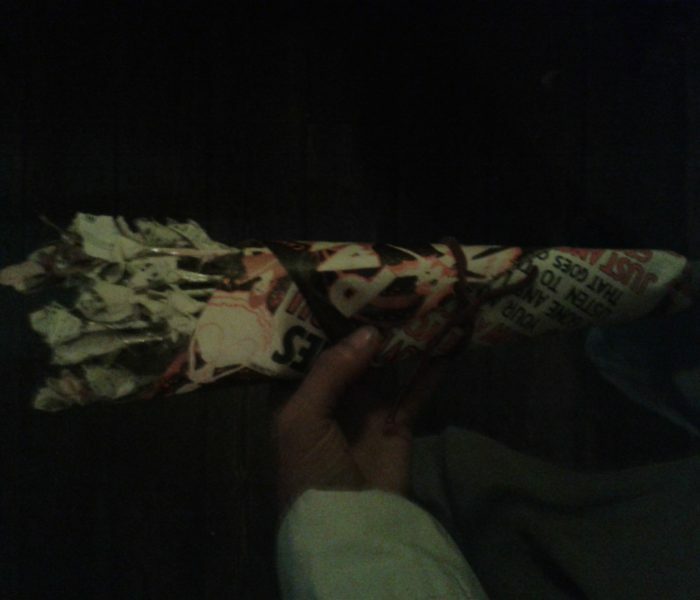 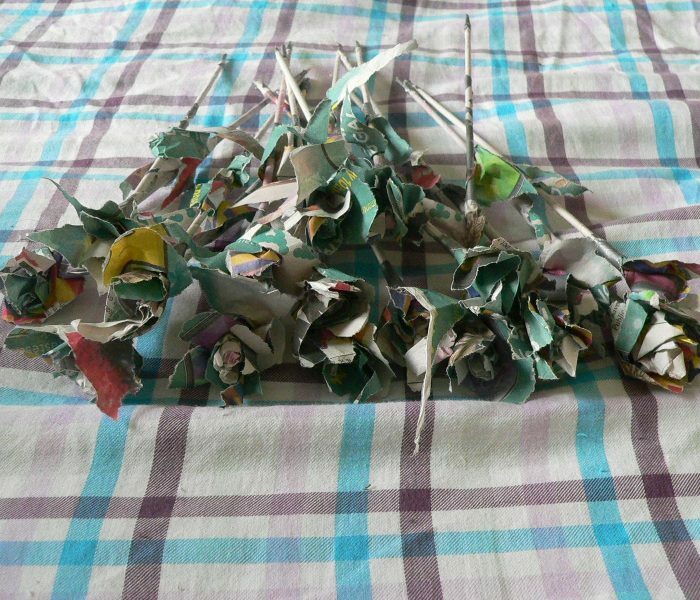 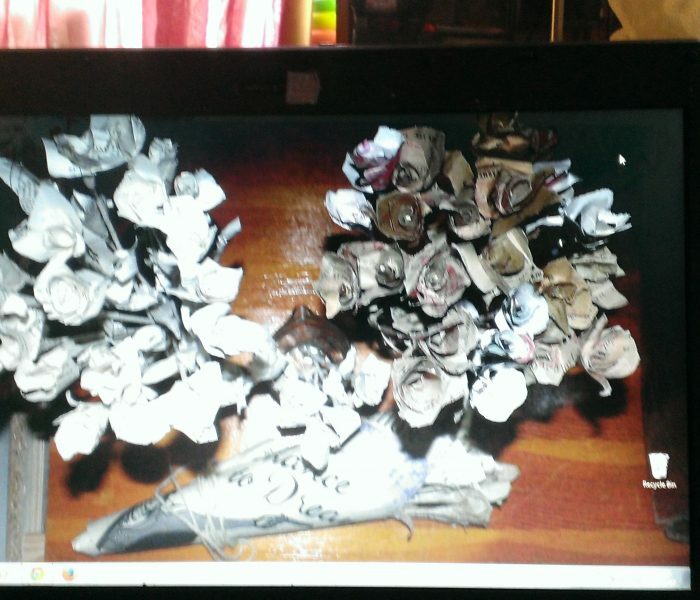 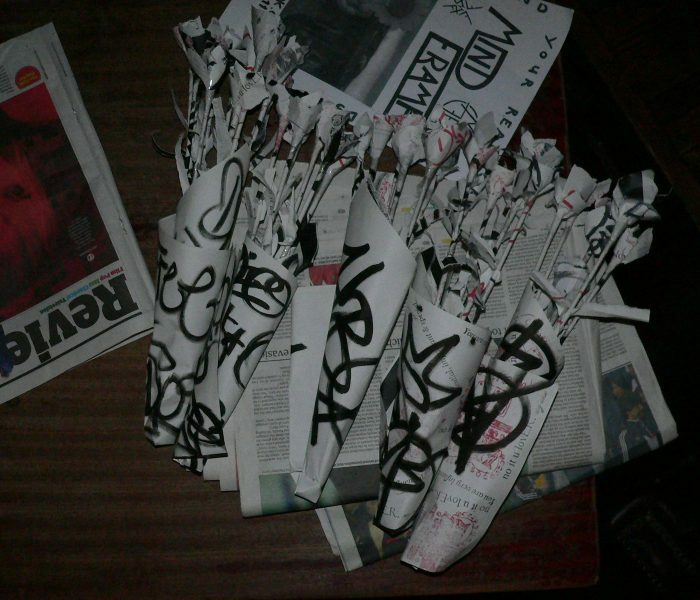 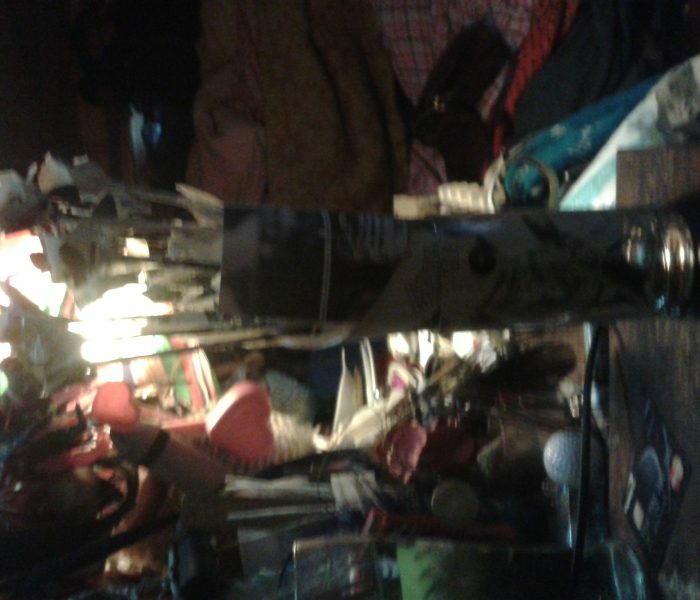 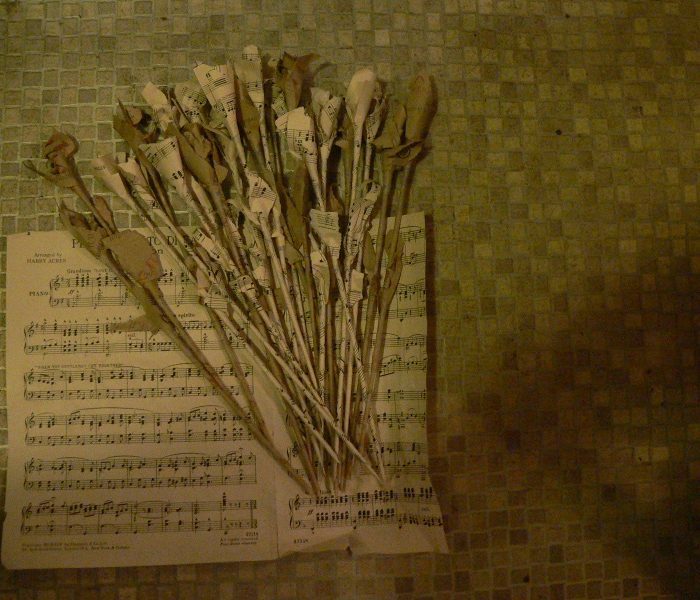 As with most of the art work I create, Topical Blooms began with some rubbish and an idea with what to do with it rather than just throw it away. 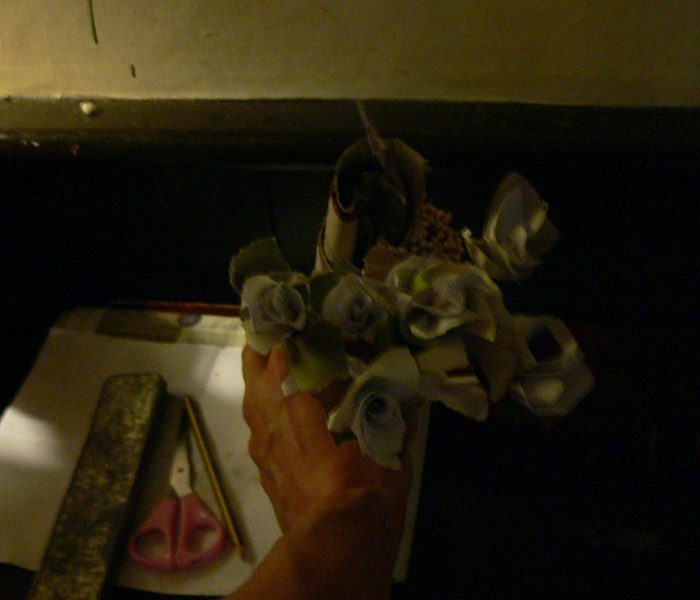 The special thing about Topical Blooms is that I keep on returning to the same creative process and reckon I’ll continue making them forever longer. 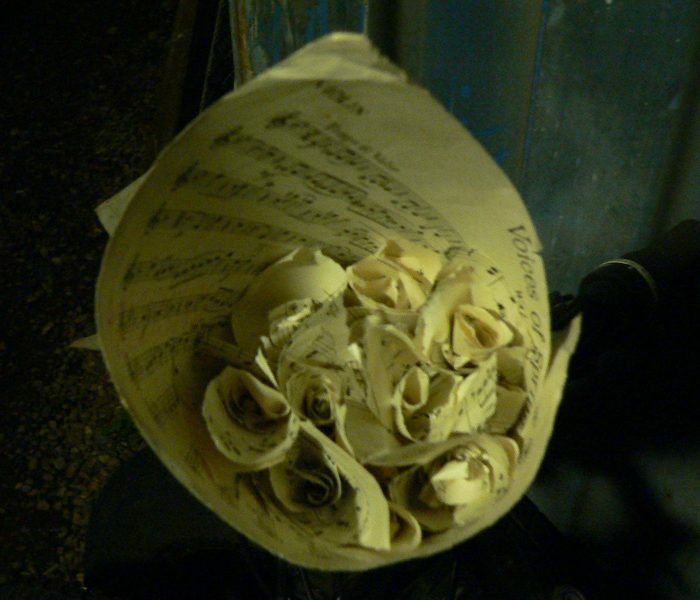 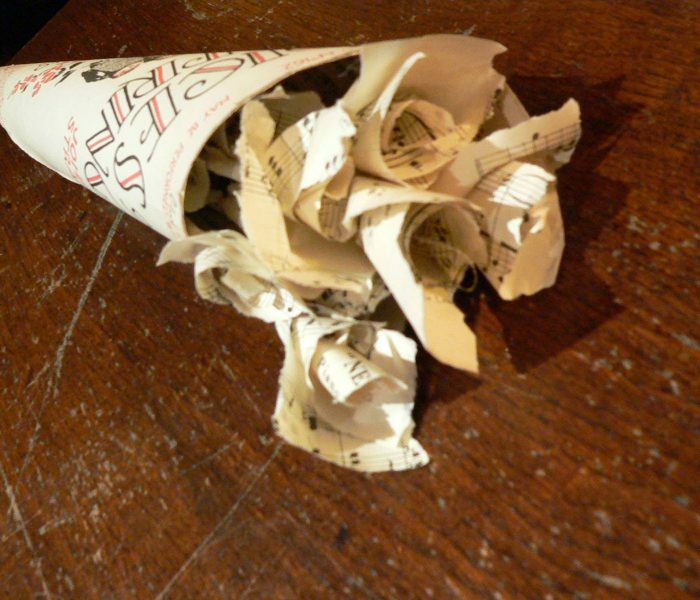 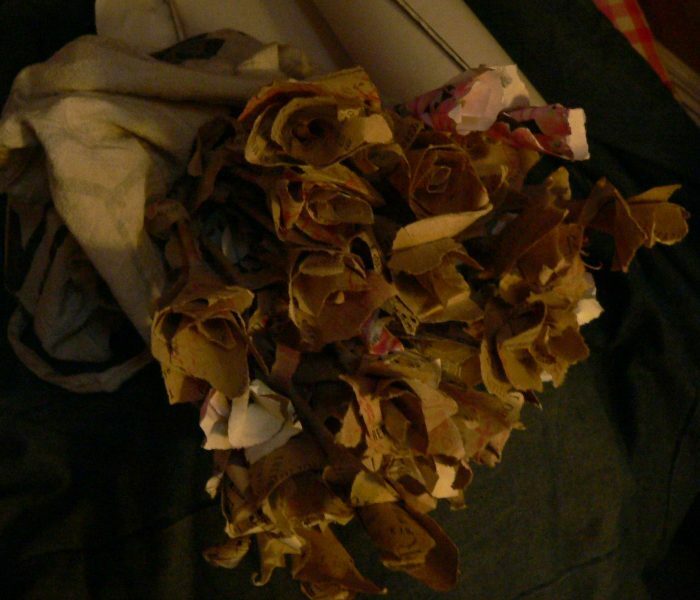 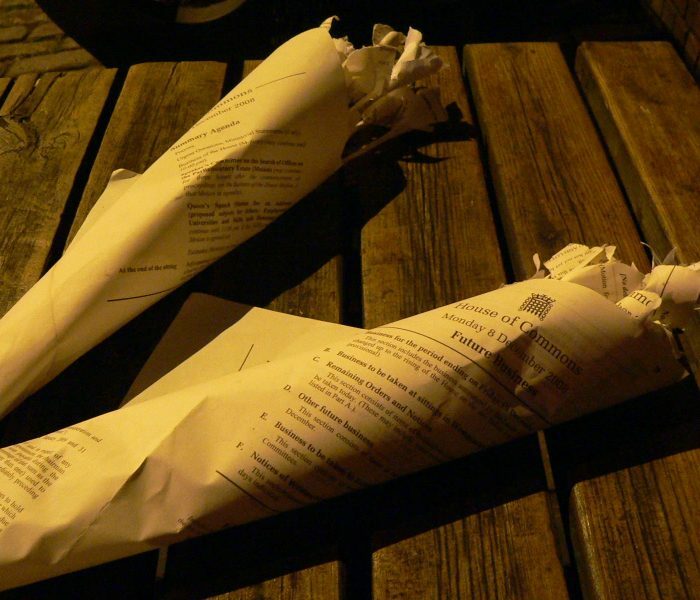 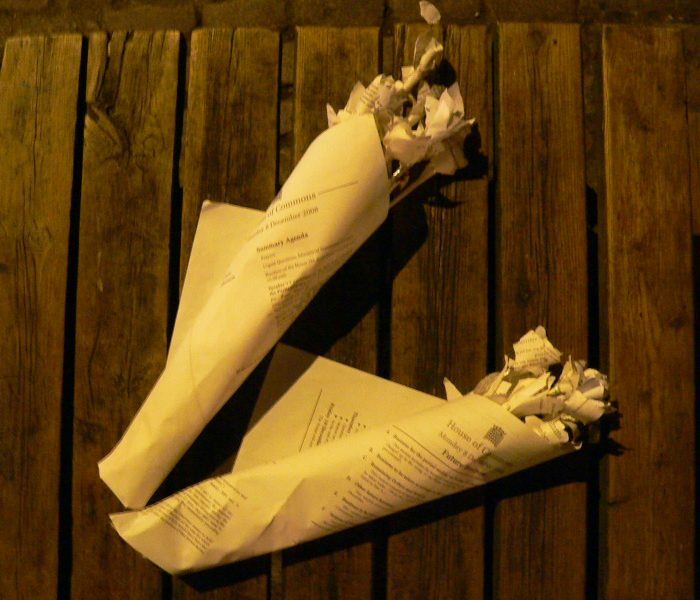 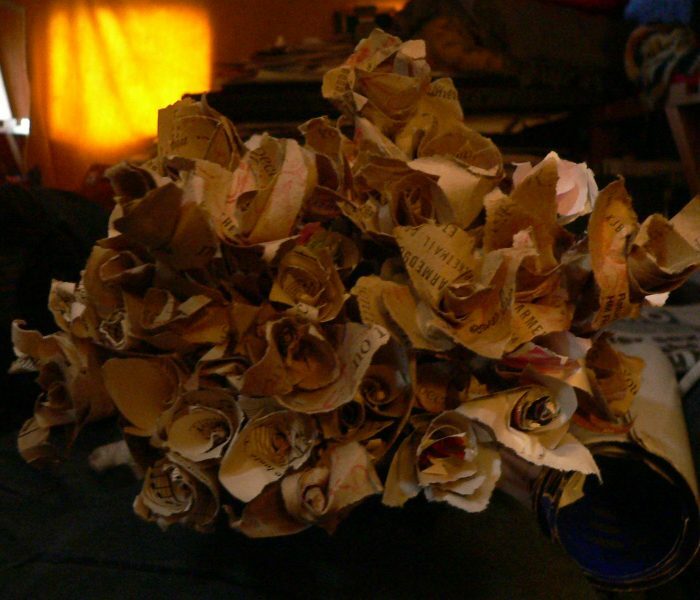 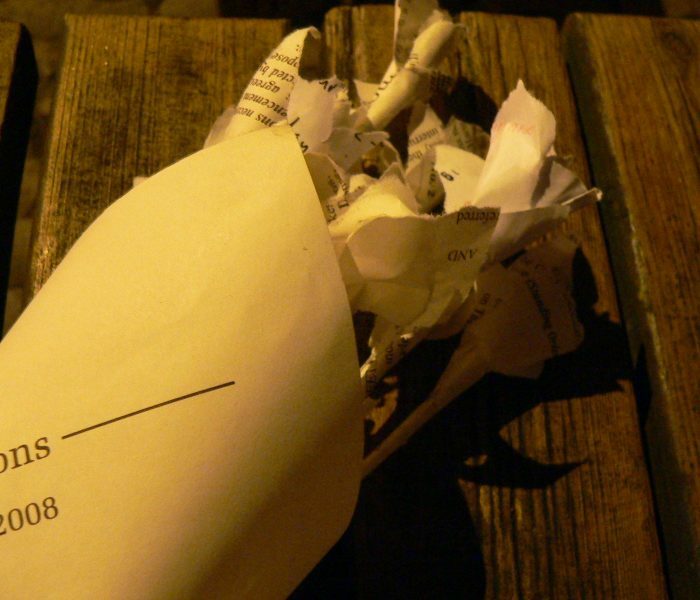 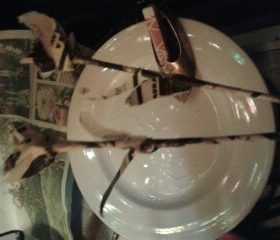 The starting tat was a torn up love letter written with angst and ripped to shreds in rage during a heated argument. 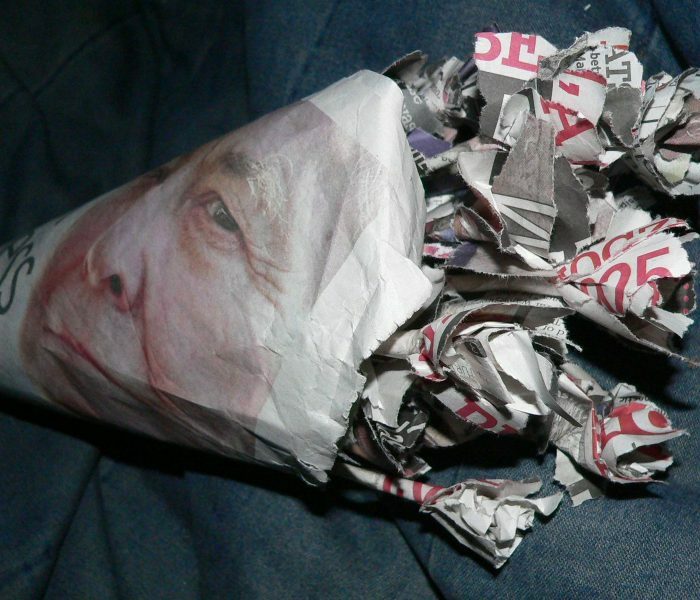 I don’t often get really angry and when I do, instantly regret whatever my over-emotive actions and reactions were. 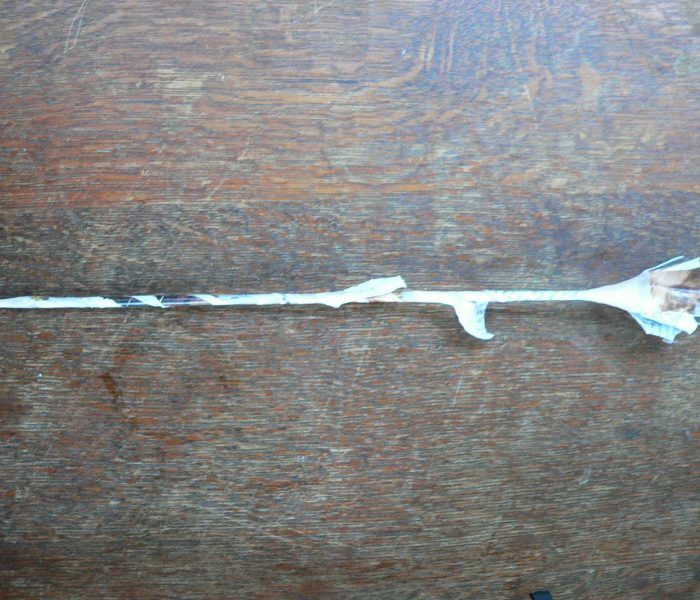 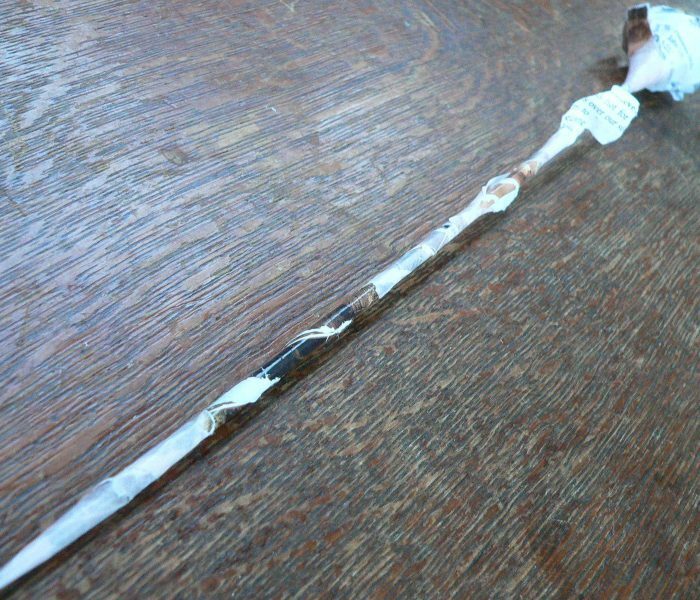 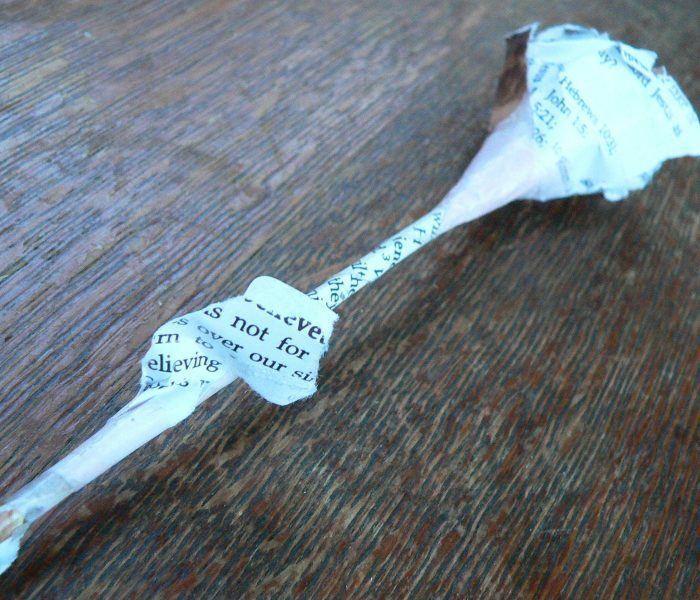 In this case, it prompted me to recreate the woeful message as a single stem rose which I then gave as a gift to the intended recipient. 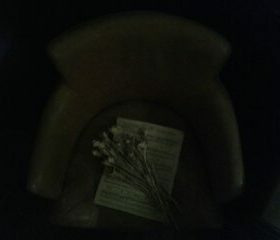 A year later, my Dad’s Mum passed away after a horrid demise with dementia. Nan Ducks (Barnes) and my Grandad, who’d sadly died from cancer many years earlier, had both been avid gardeners. 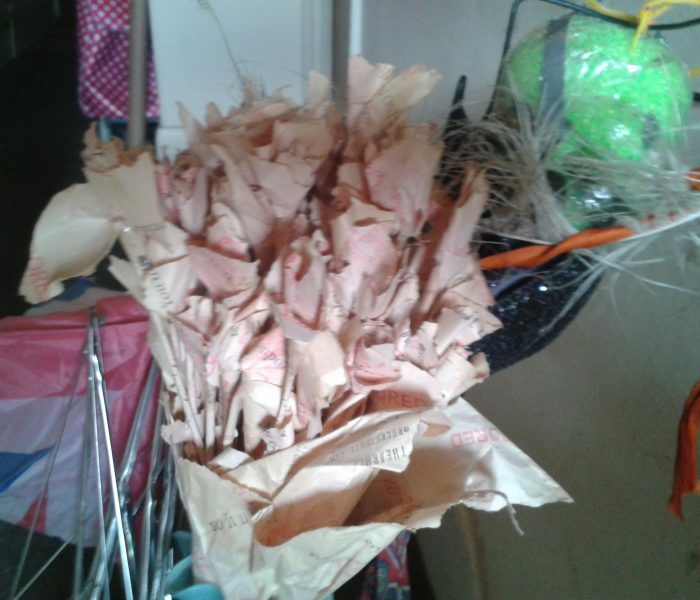 Pops was more into growing food and rummaging through wildlife whereas Nan was into bedding plants, pruning and aesthetics. 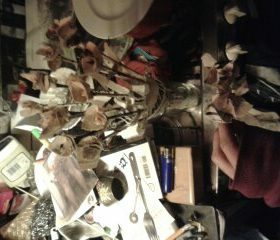 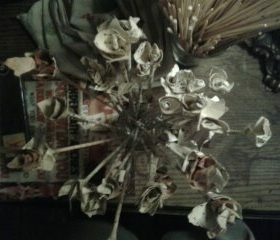 One thing she despised though was cut flowers. 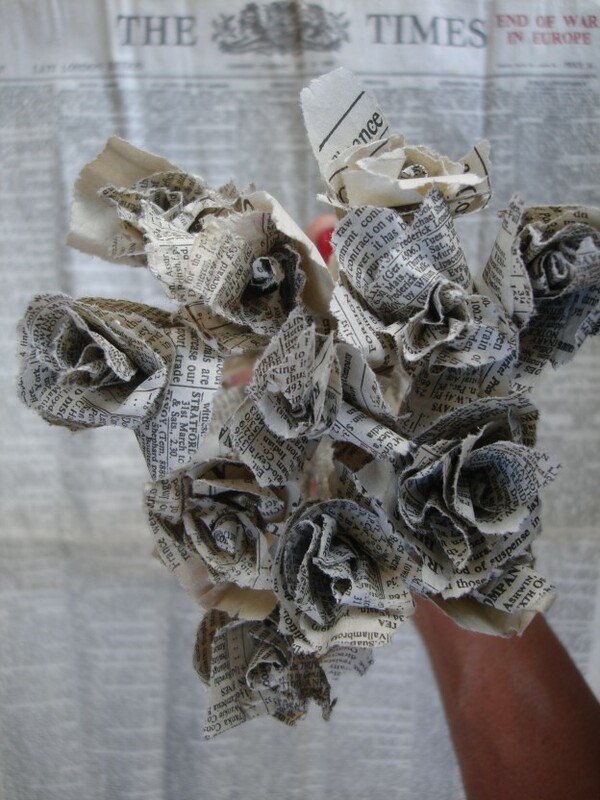 Nan Ducks was also an habitual doer of crosswords, namely in her Daily Express newspaper and her thesaurus was always close by her side. 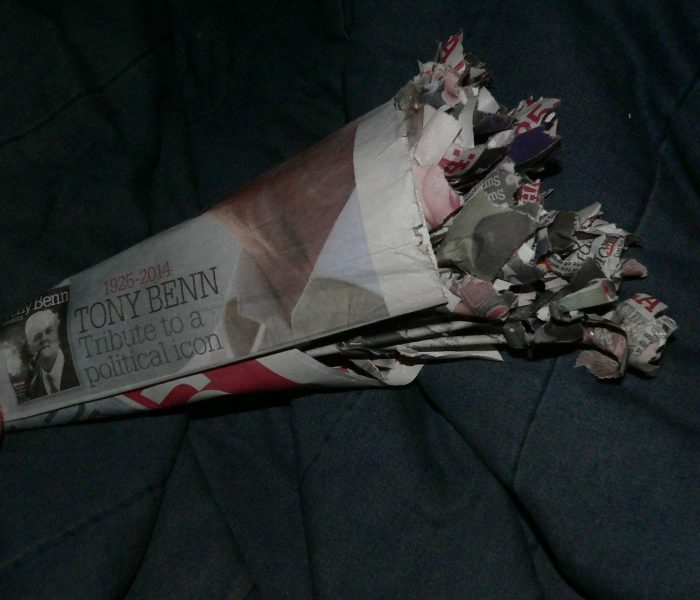 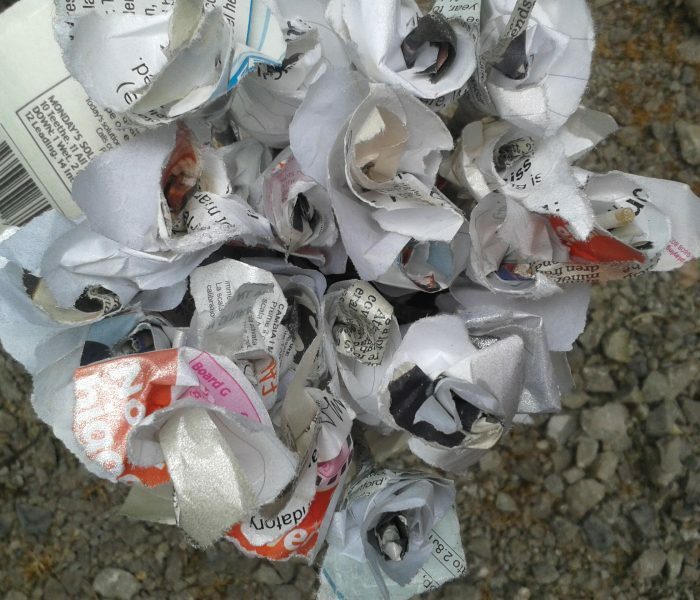 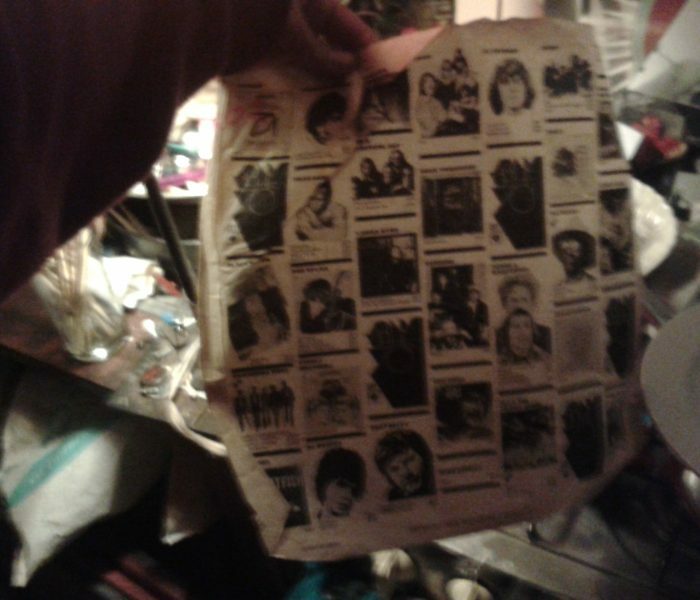 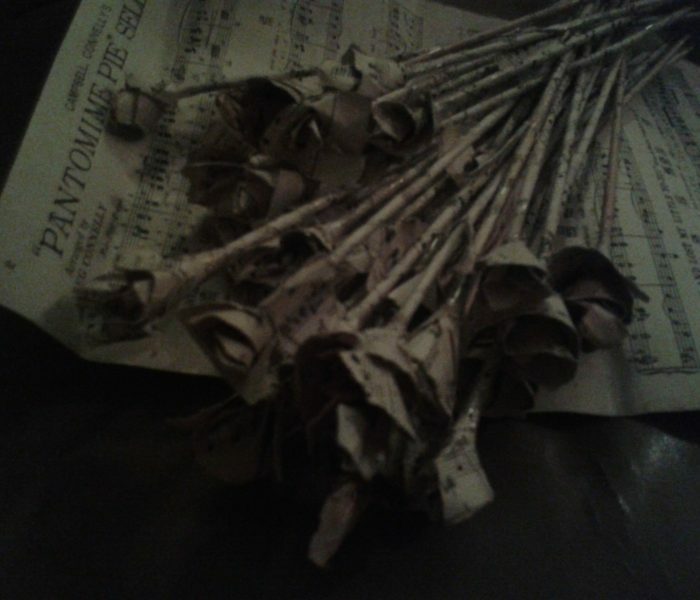 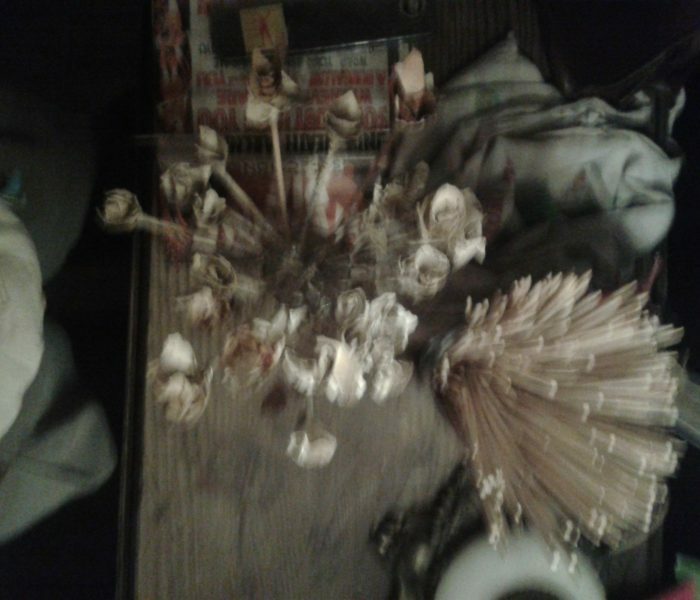 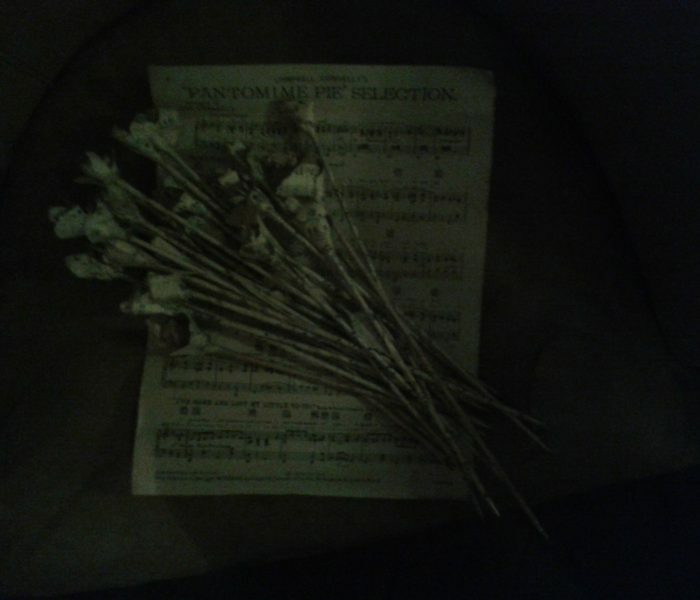 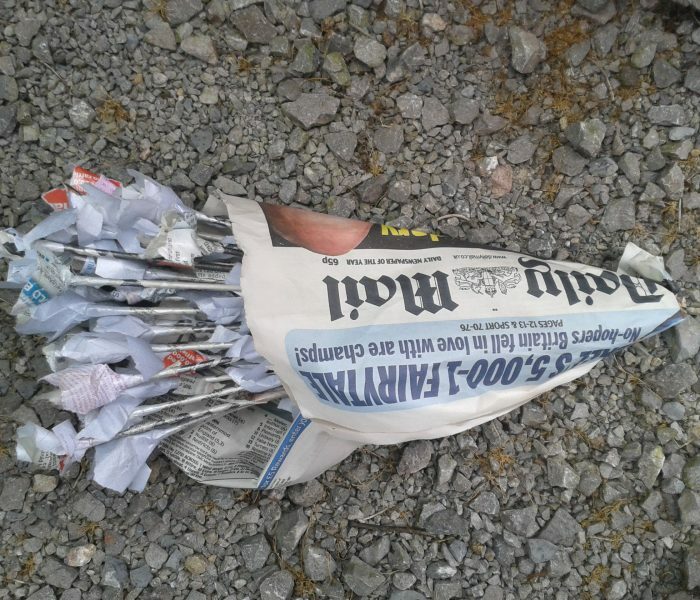 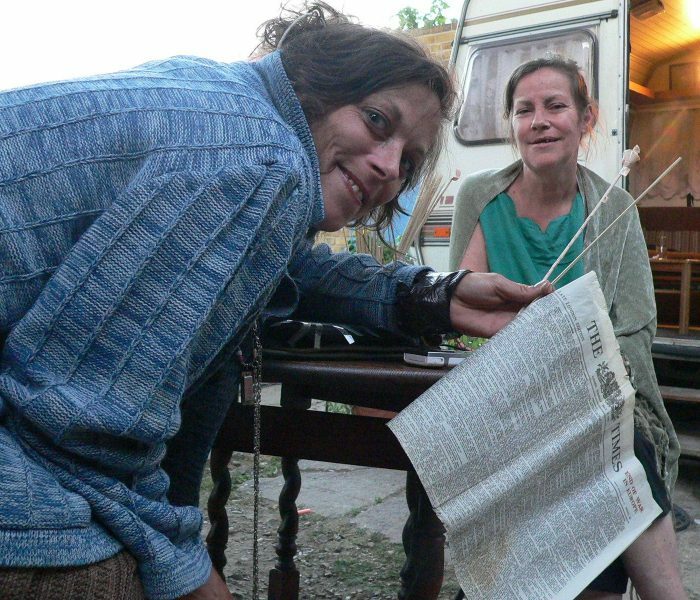 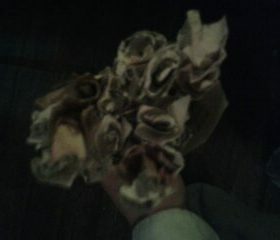 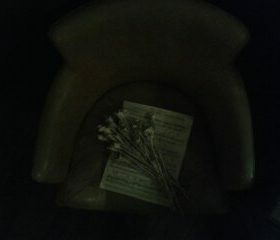 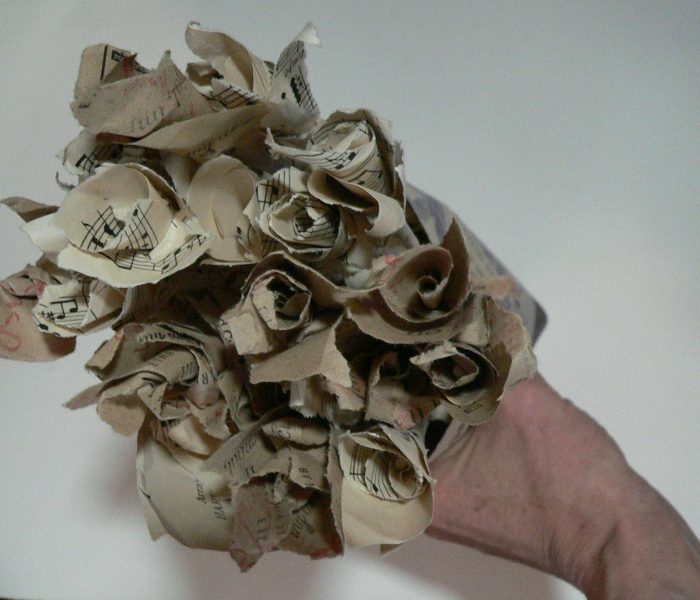 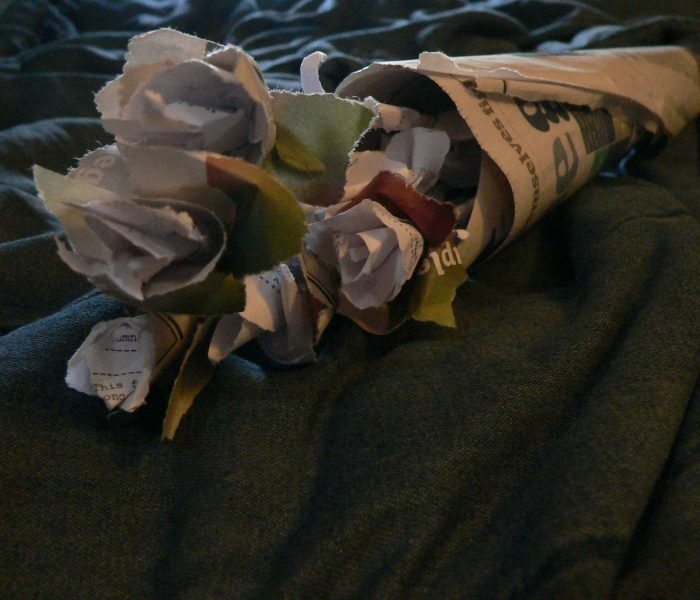 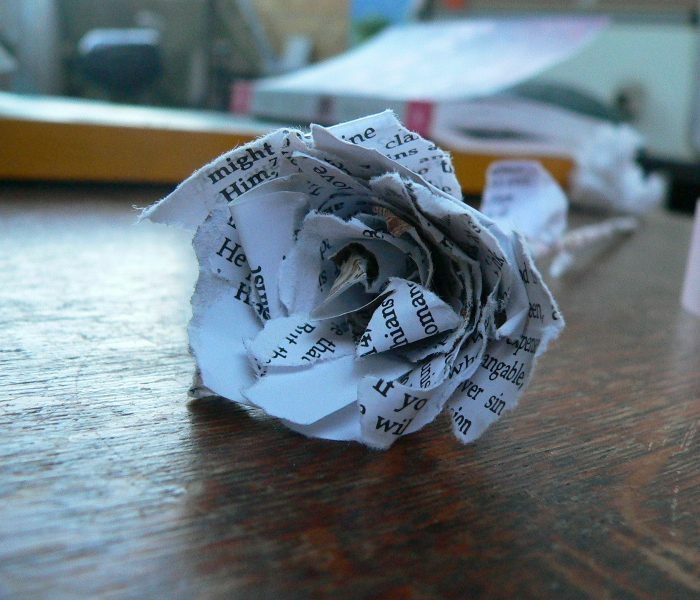 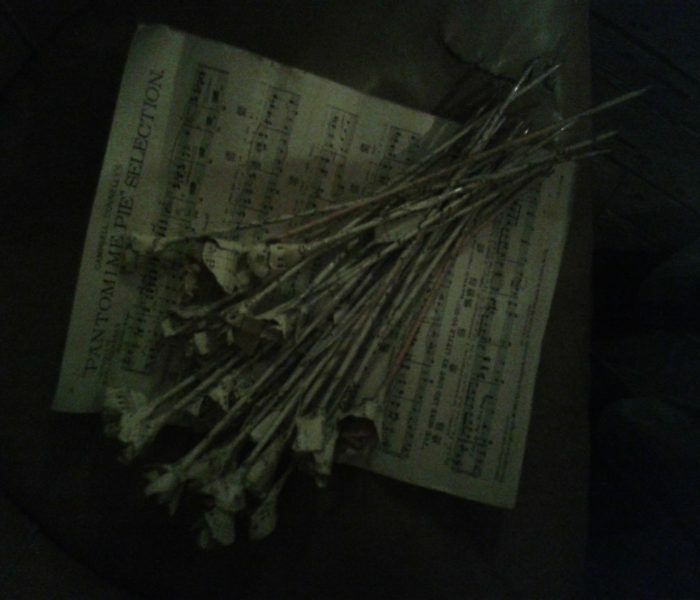 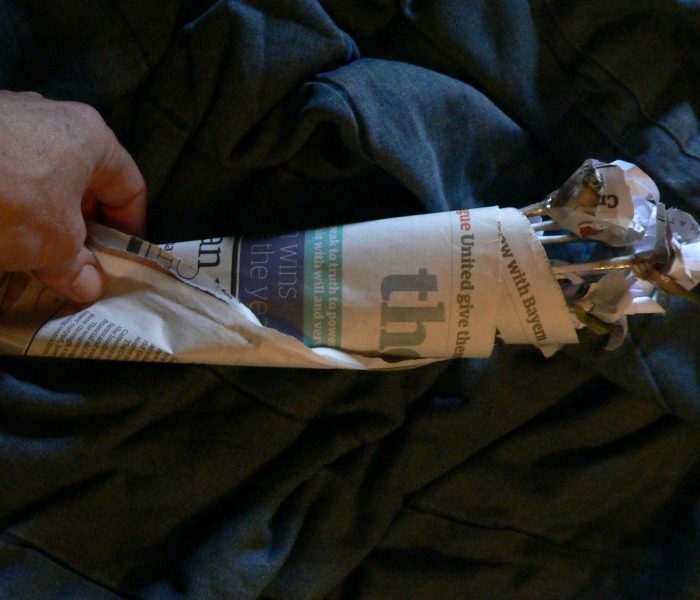 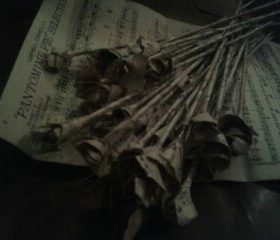 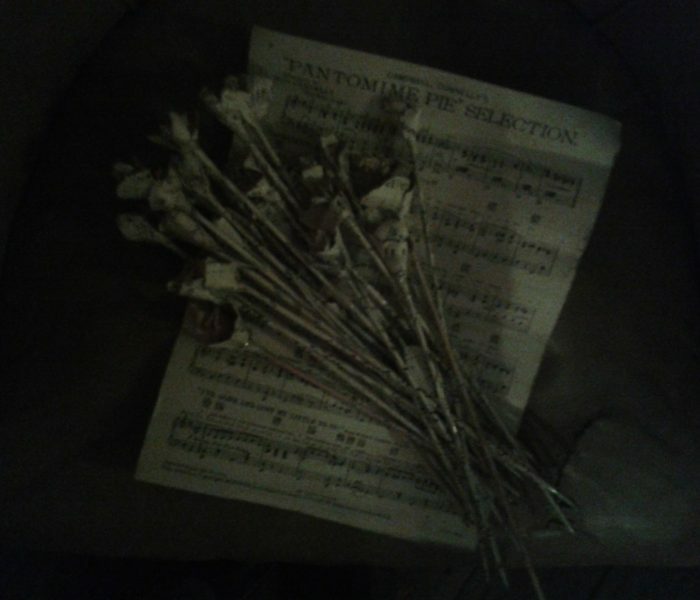 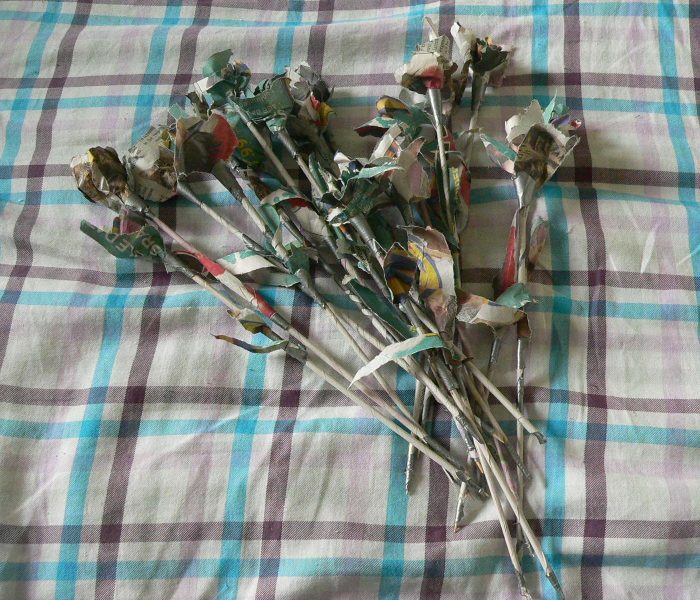 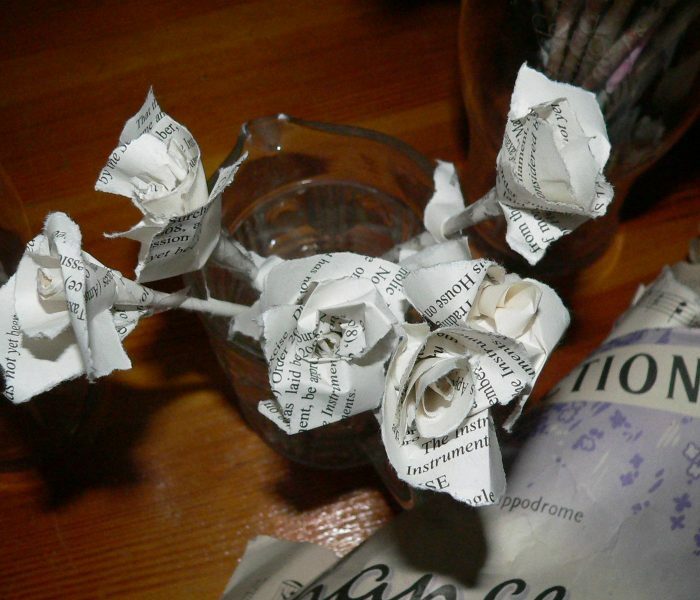 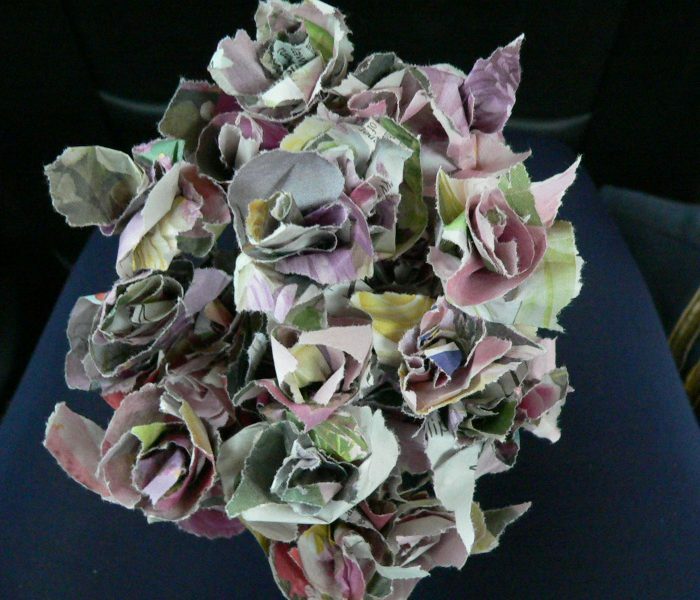 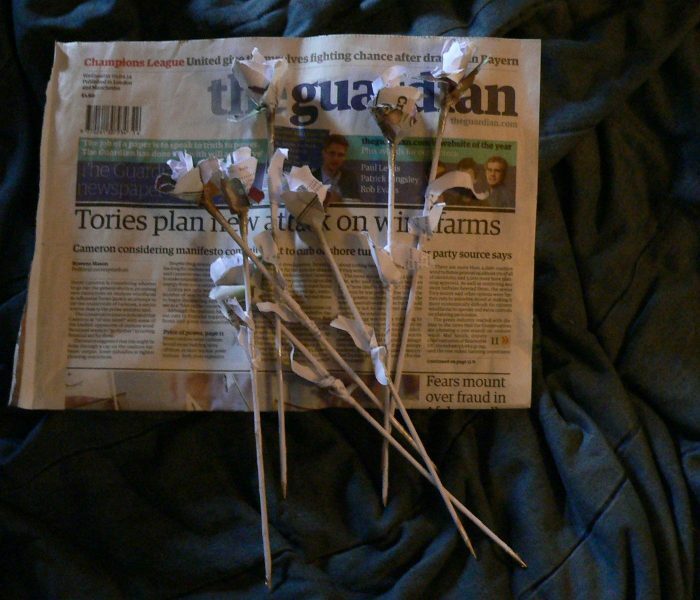 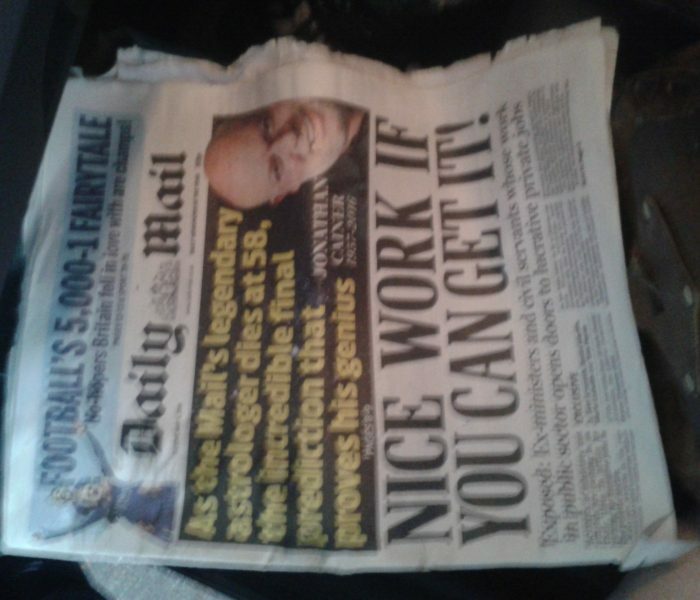 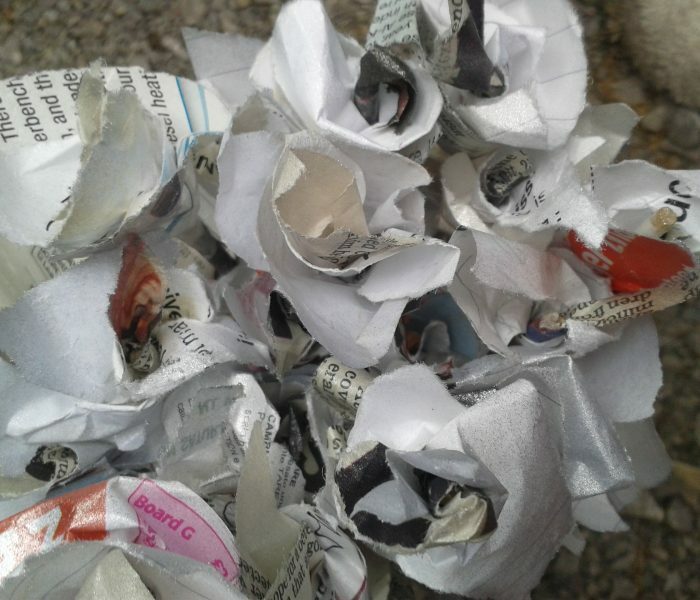 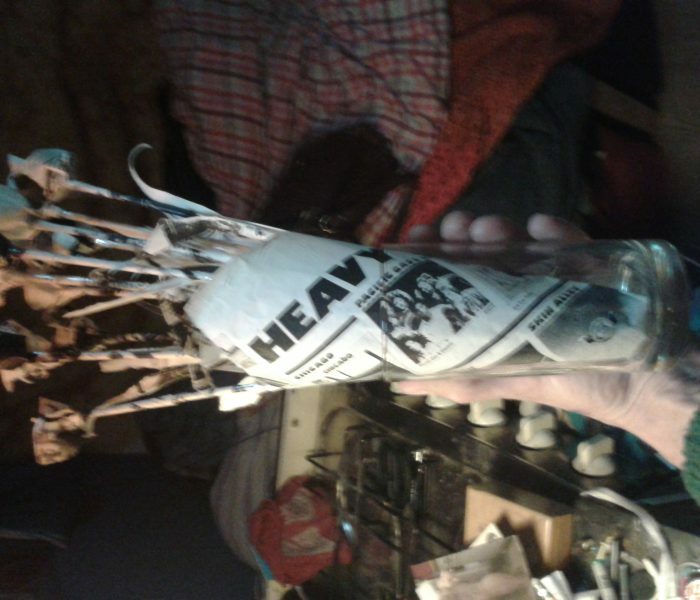 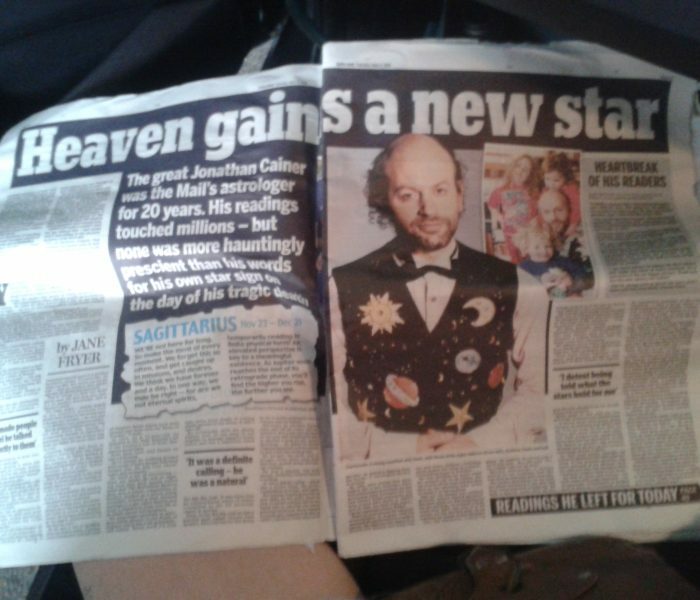 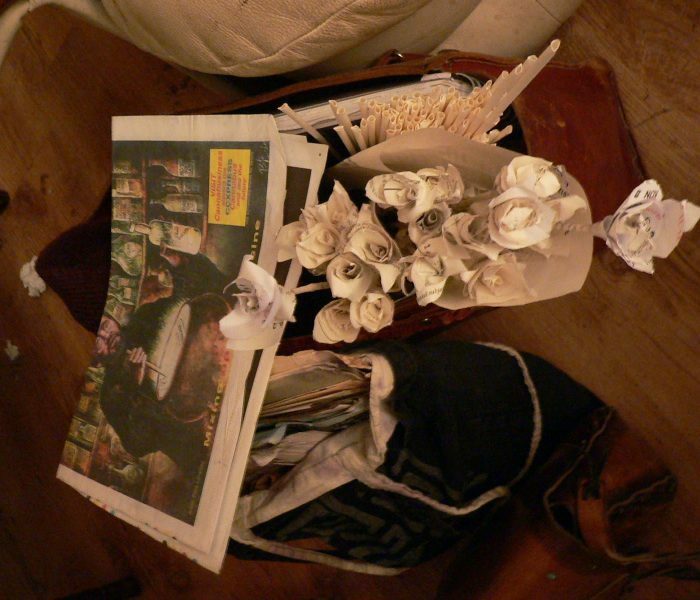 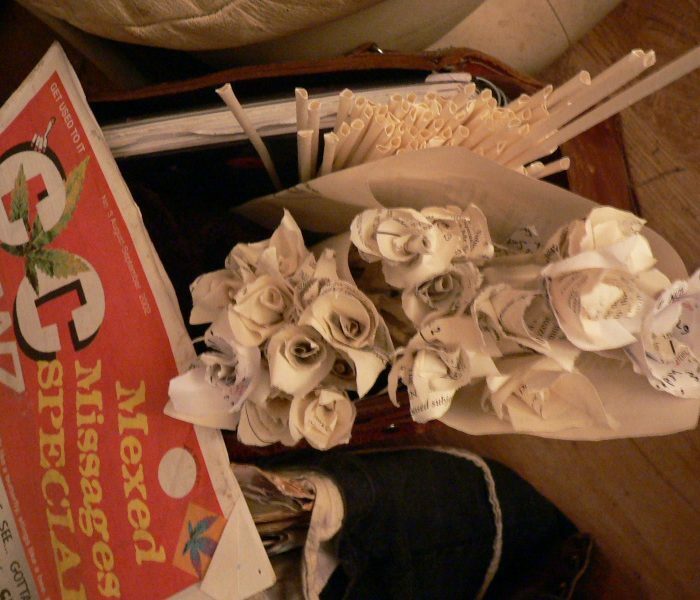 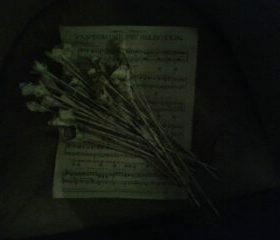 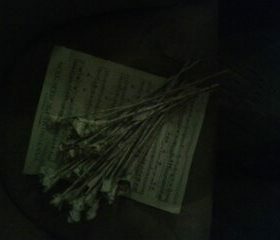 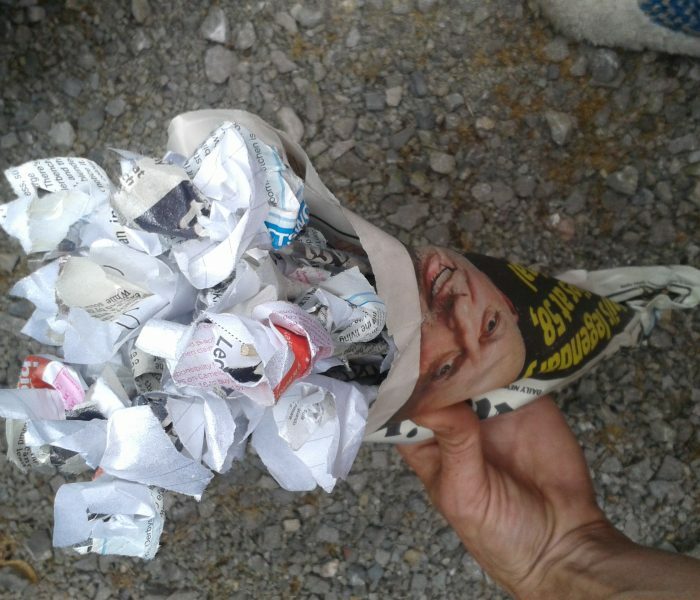 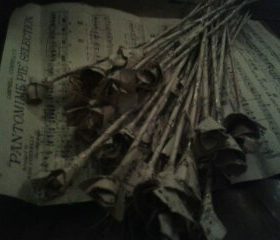 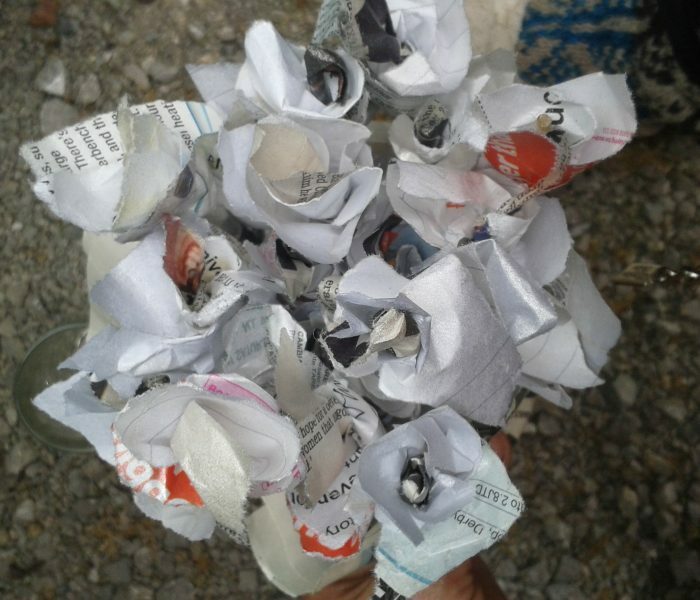 For her funeral, I made a bouquet of Topical Blooms out of newspaper crosswords as were her wishes for there to be no cut flowers as means of a memorial. 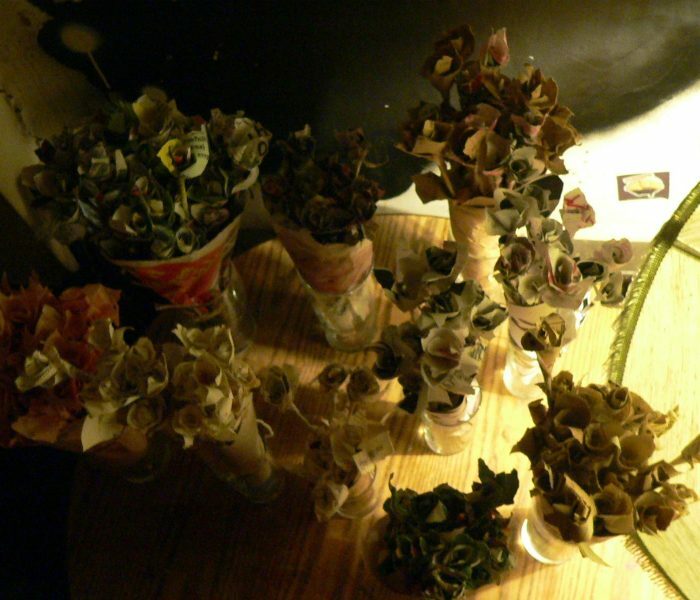 The following year or so later, my Mum’s twin Brother, Uncle Roy passed away following such a stream of ill health and for his funeral, I prepared Topical Blooms out of his old prescriptions. 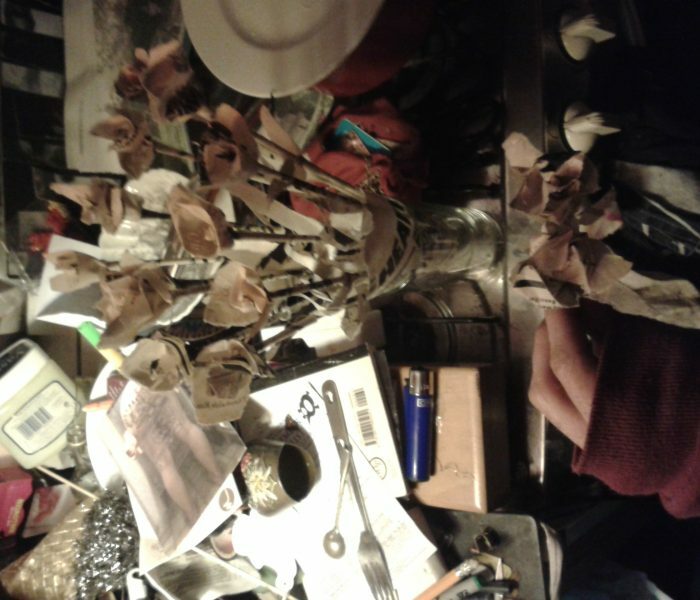 I ceased to make any Topical Blooms for quite a while after this as they seemed to be all to trapped iun a sense of doom and gloom. 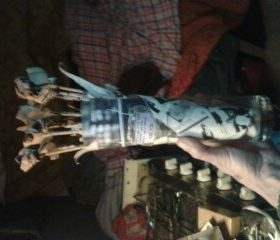 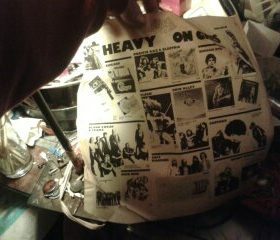 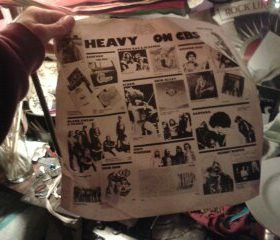 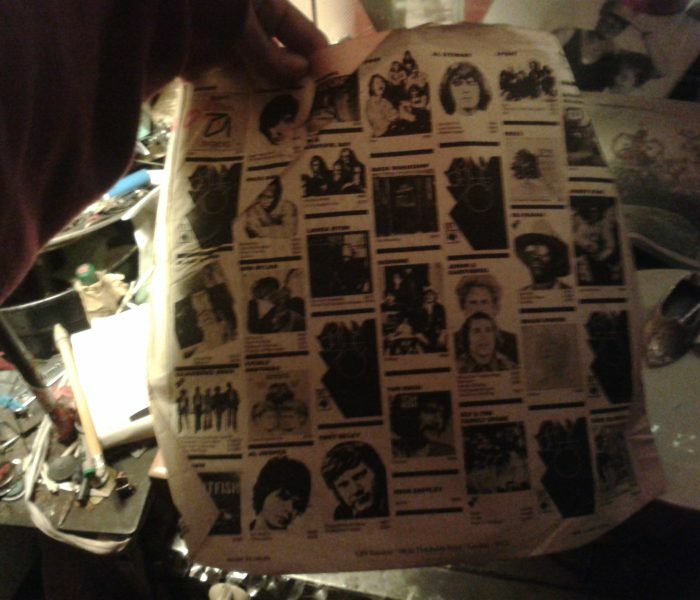 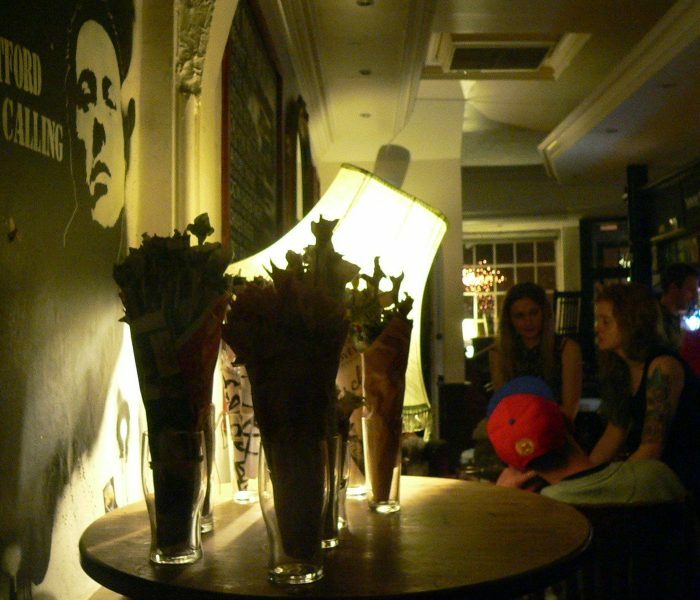 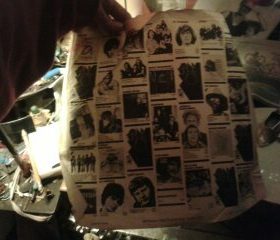 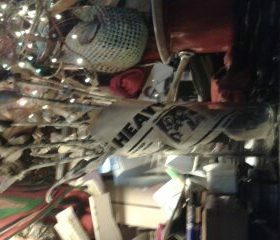 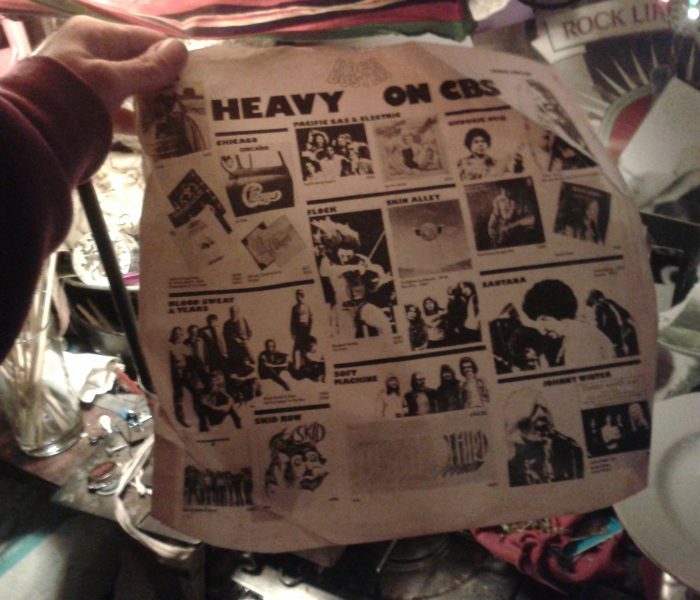 However, some time later, I rekindled the process under more positive connotations and many more have been made since. 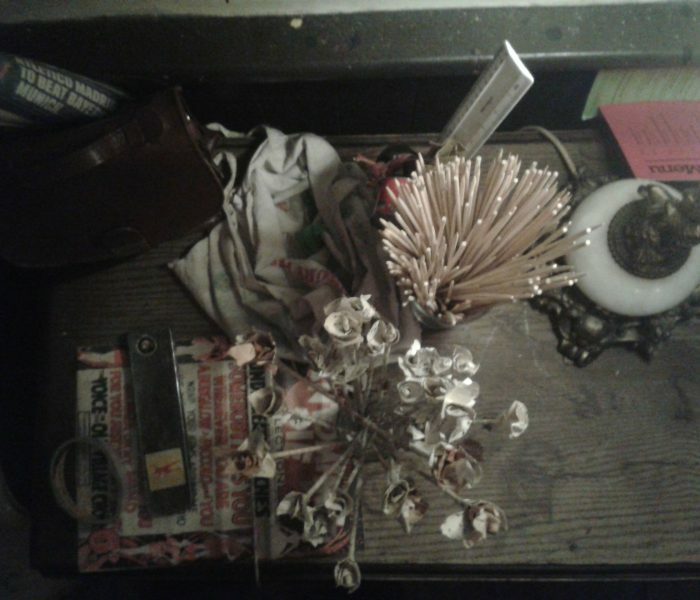 This is a good example as to why it has taken me so long to tidy up ETC as the ever-forming pile of topics just doesn’t stop and is stacked up like perpetual blossom in the making. 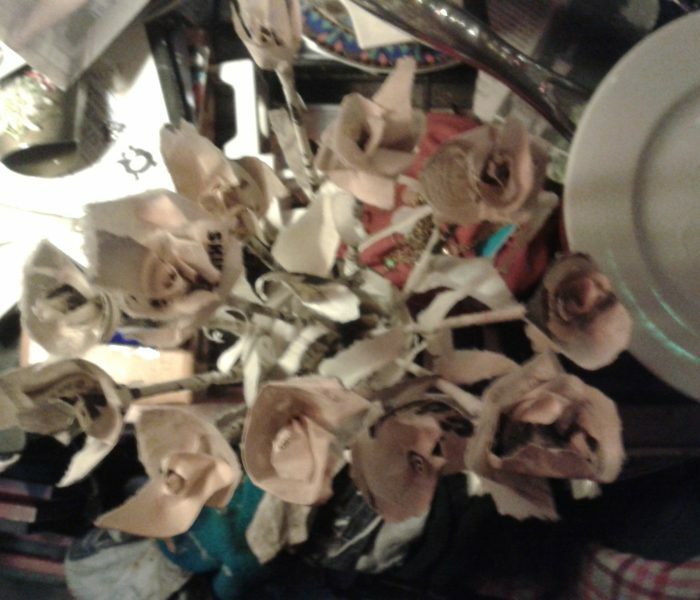 My Mum says I can’t work for love alone but it seems I most often do and although a result of this is that I’m generally brasset, I just don’t seem able to put a price tag onto something that has stemmed from such an intricate process. 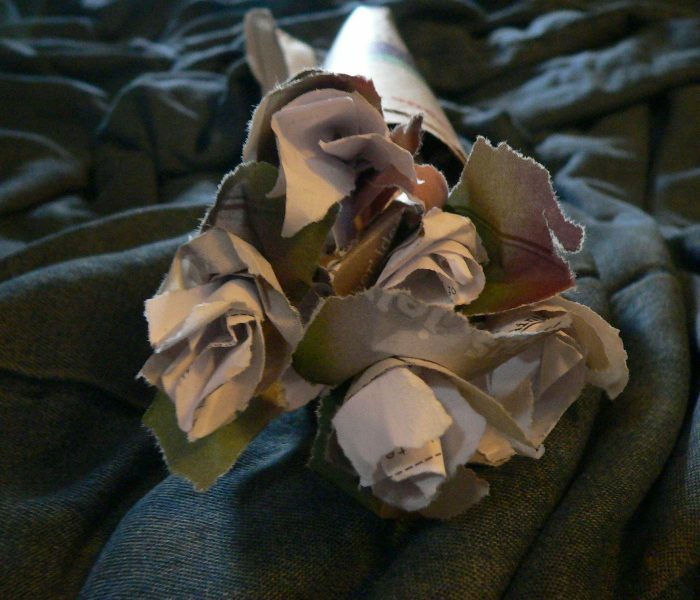 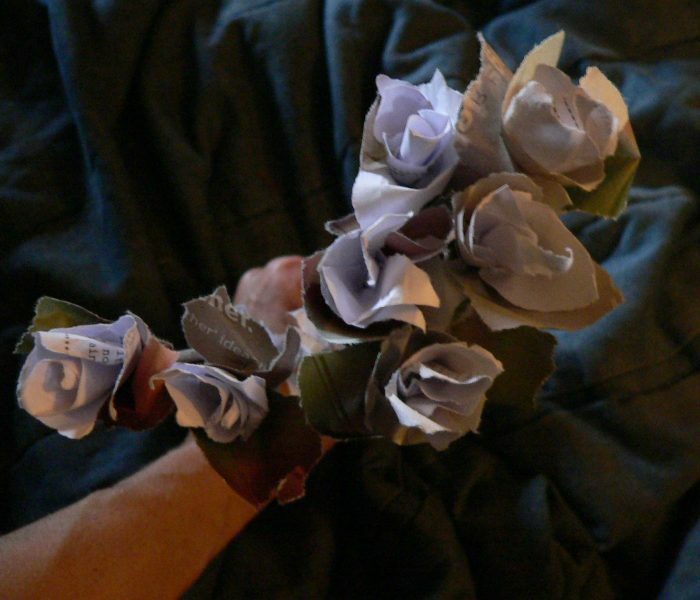 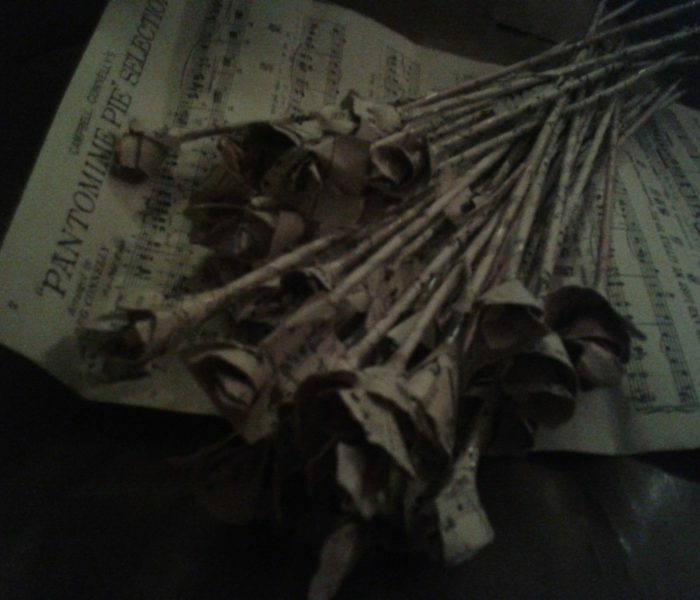 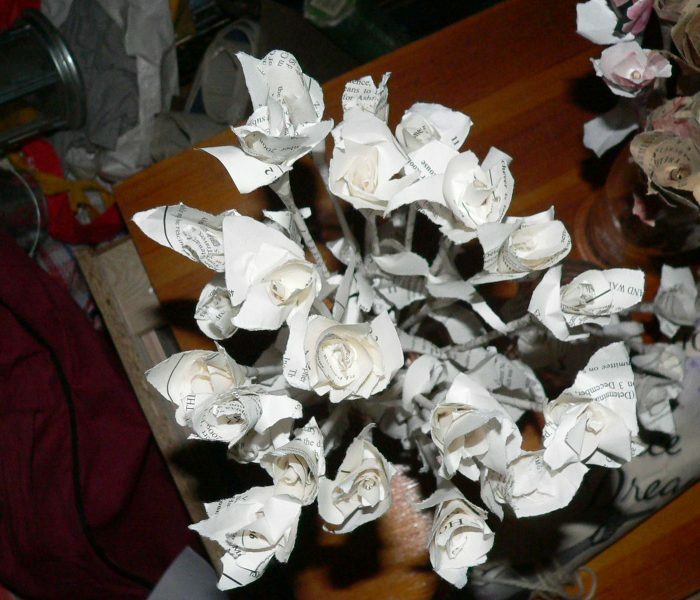 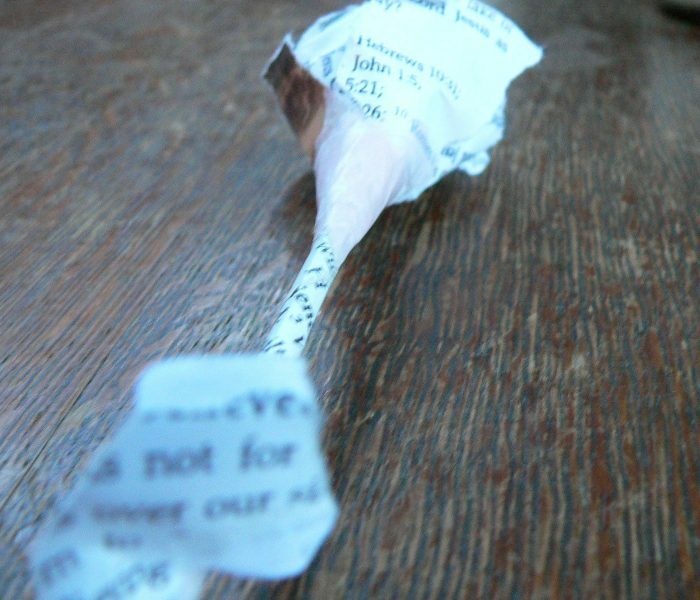 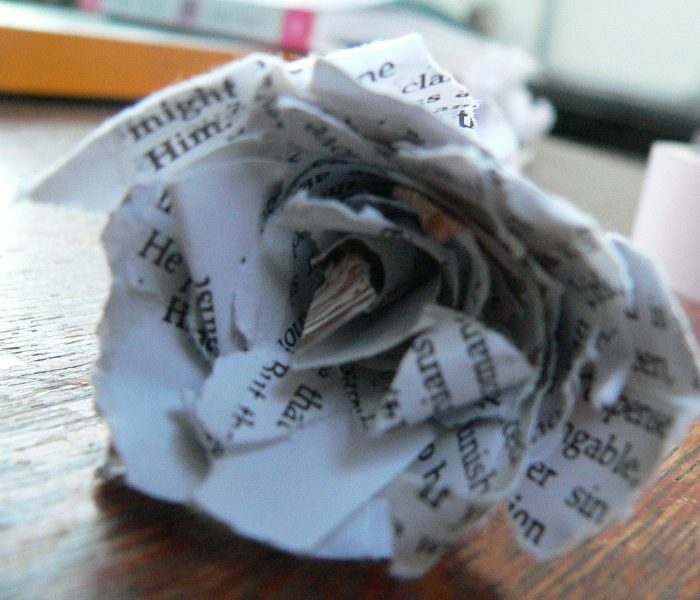 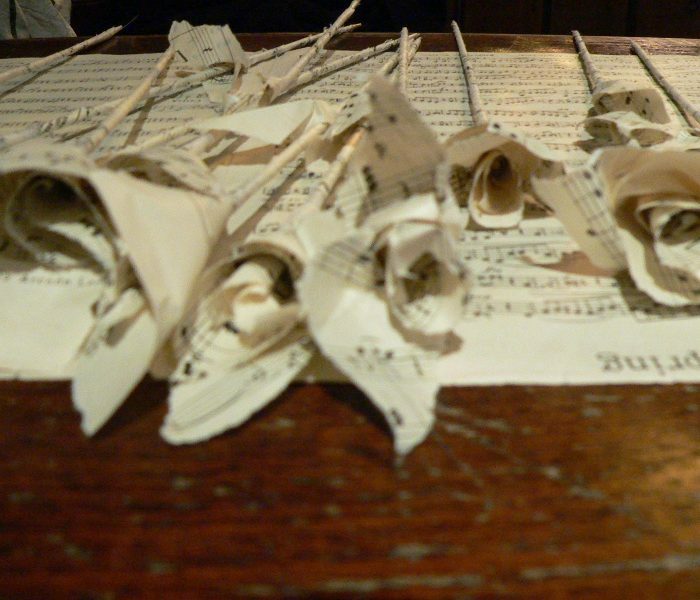 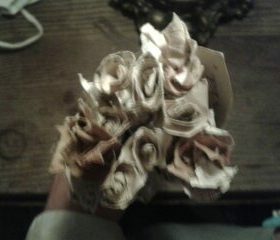 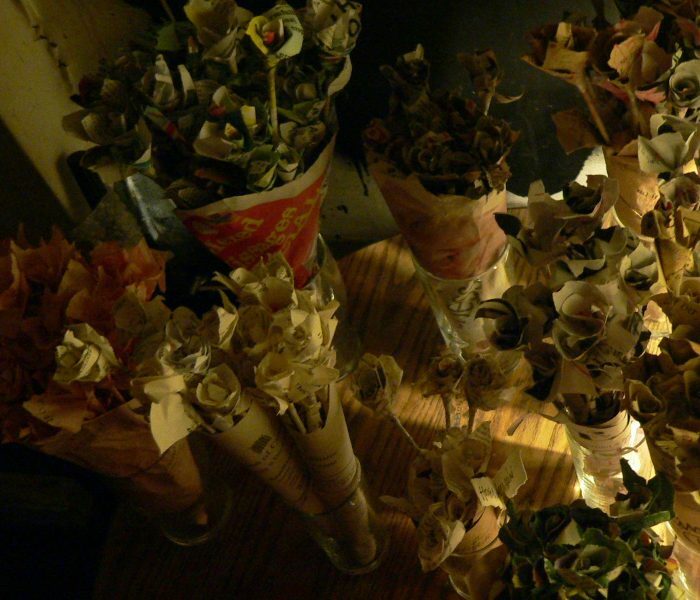 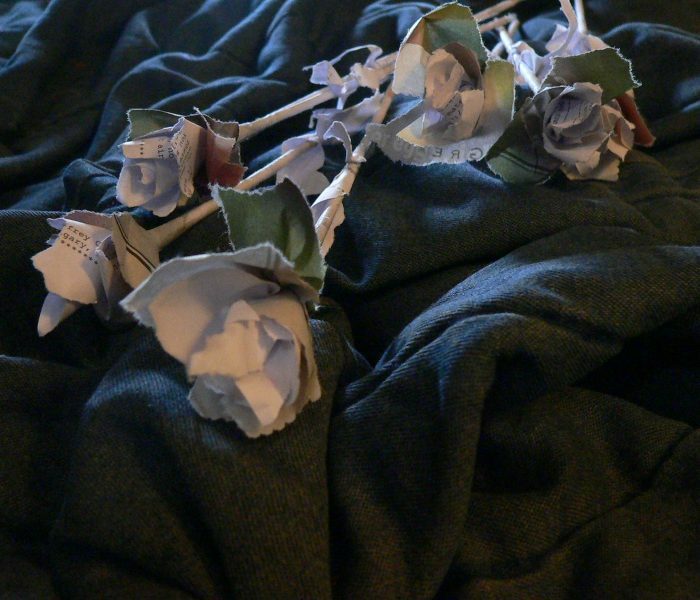 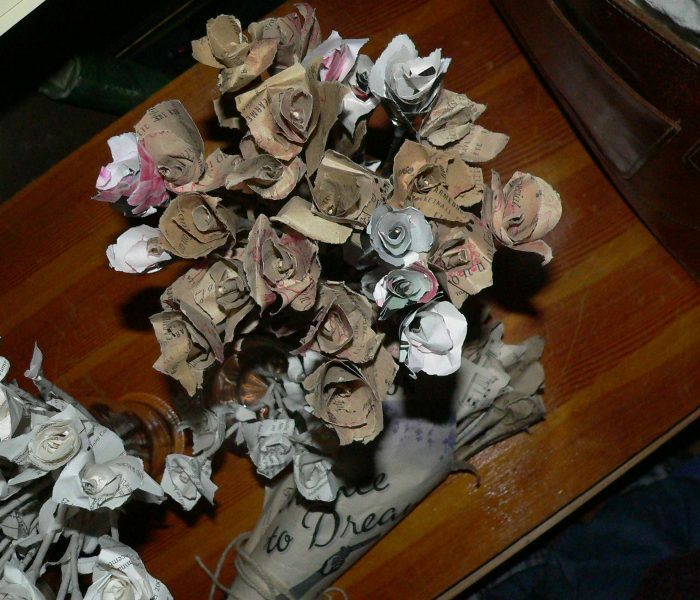 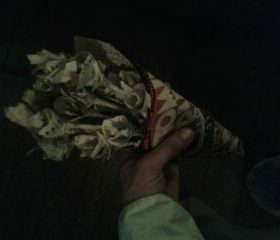 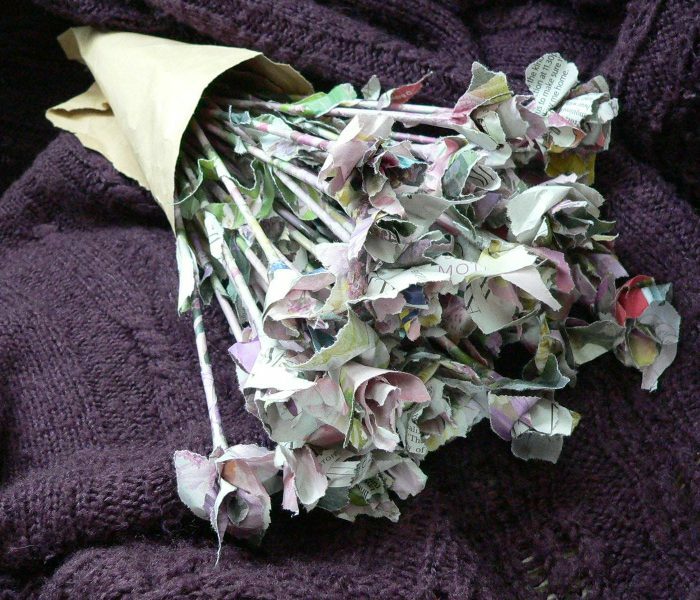 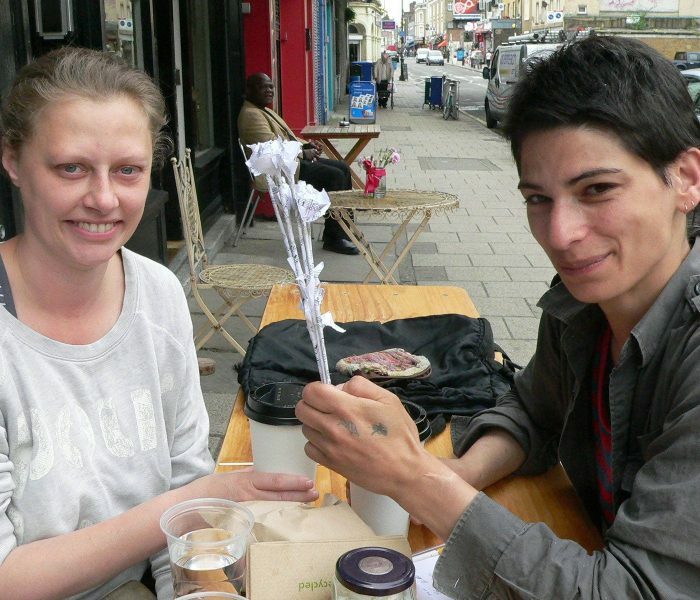 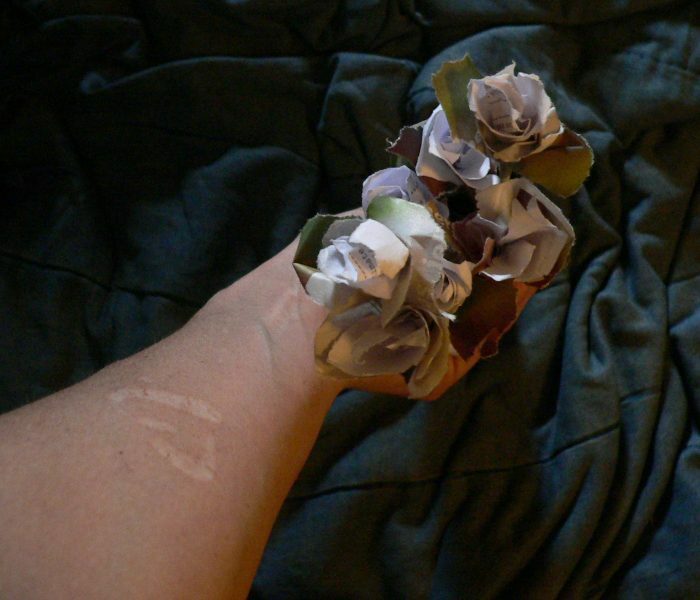 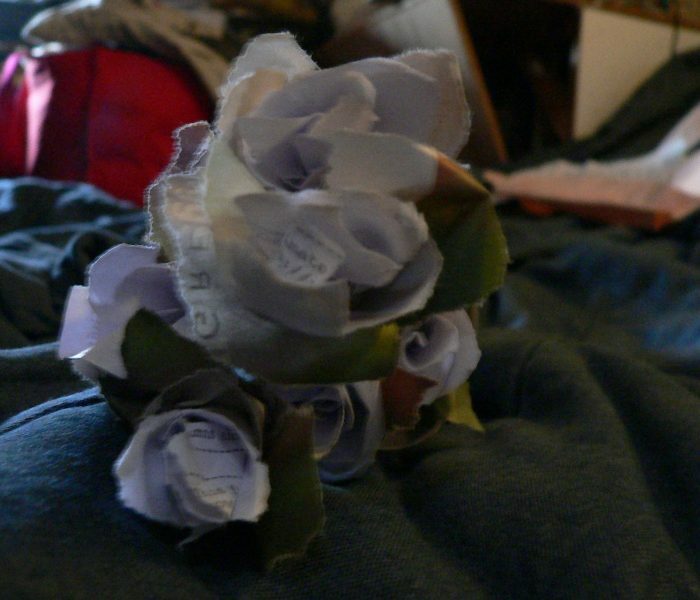 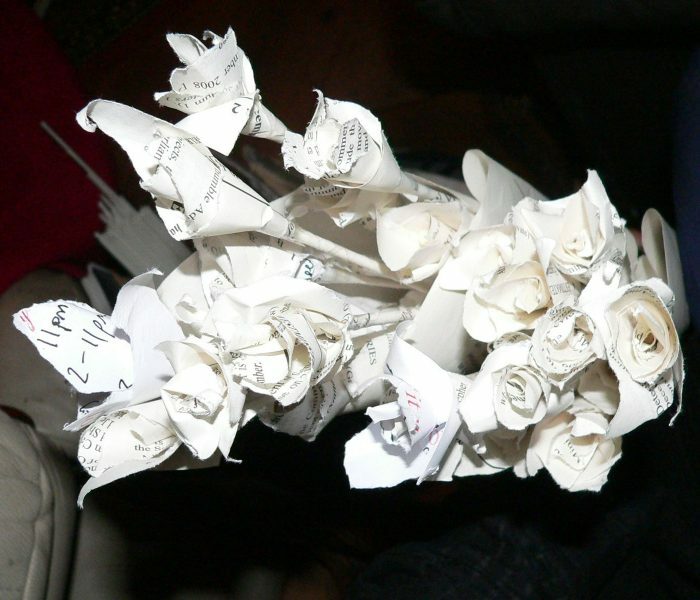 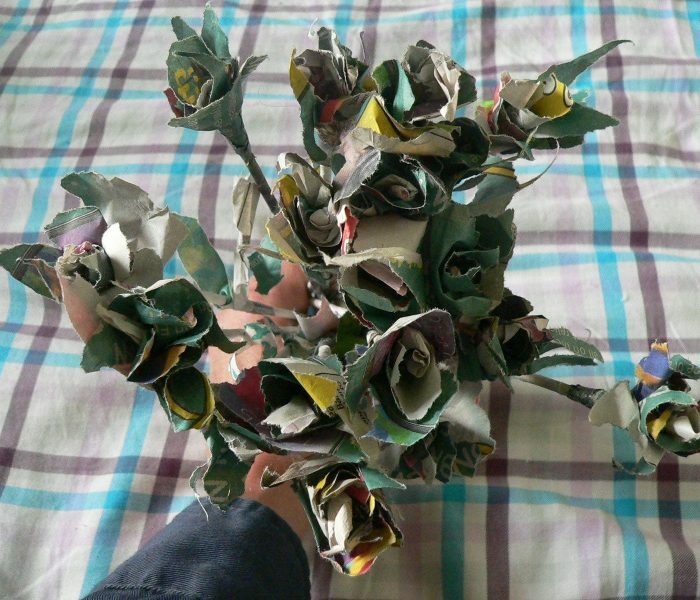 The positive feedback I receive as to what the paper roses mean to the recipients is worth far more than any monetary value. 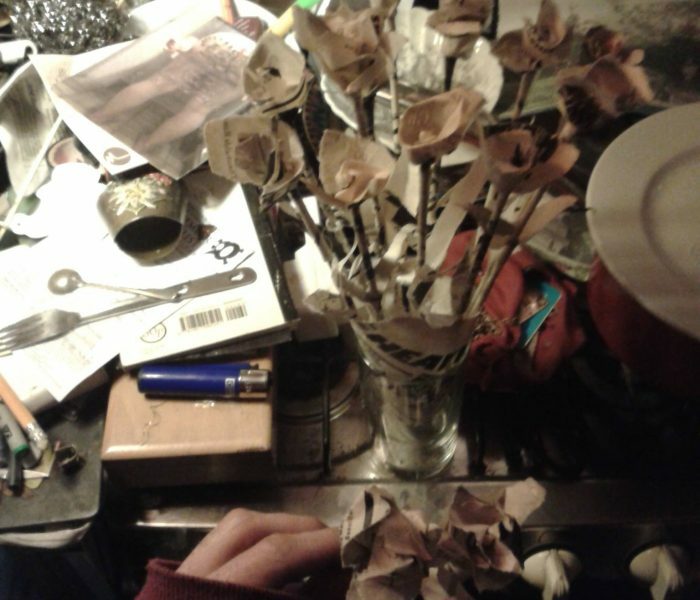 An artistic process for me lessens in actual creativity if its a means to an end. 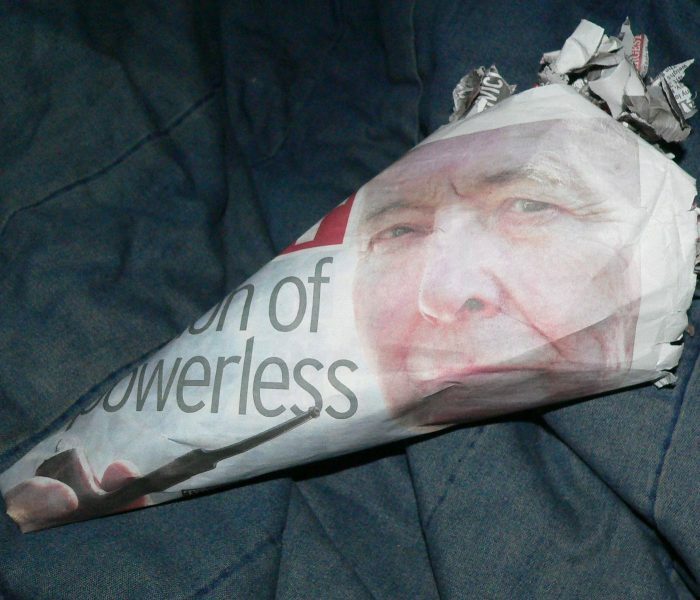 Although many folk have suggested I could make a living out of Topical Blooms, I beg to differ as I would actually go loopy if that was what I was to do for the rest of ever. 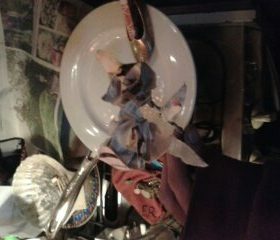 Every now and then for special occassions and when the fancy takes me but that’s quite enough thank you very much. 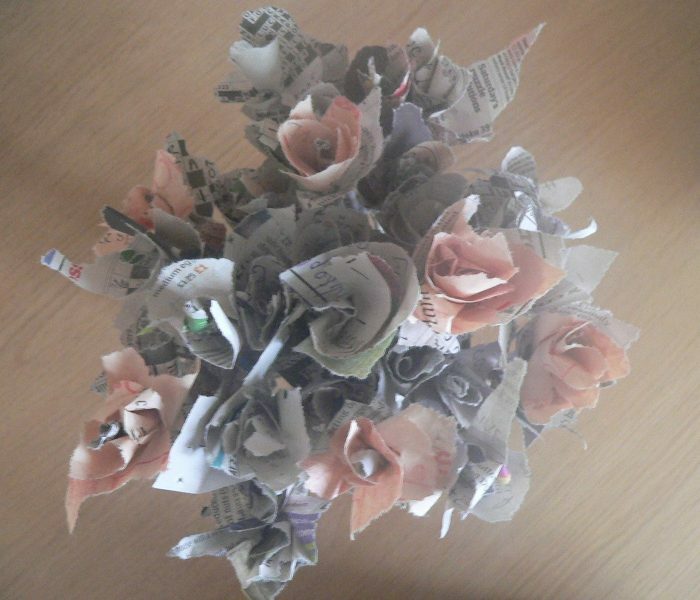 I must admit though, I do love’em and if you do want to pay me an extortionate amount of money for a unique bouquet, don’t hesitate to get in touch, it will be my pleasure!